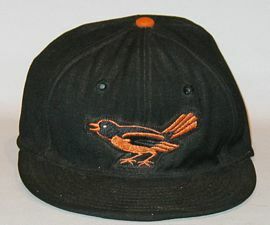 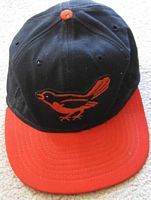 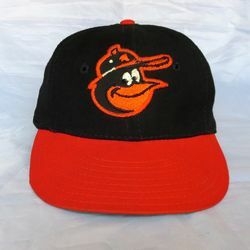 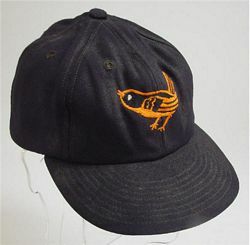 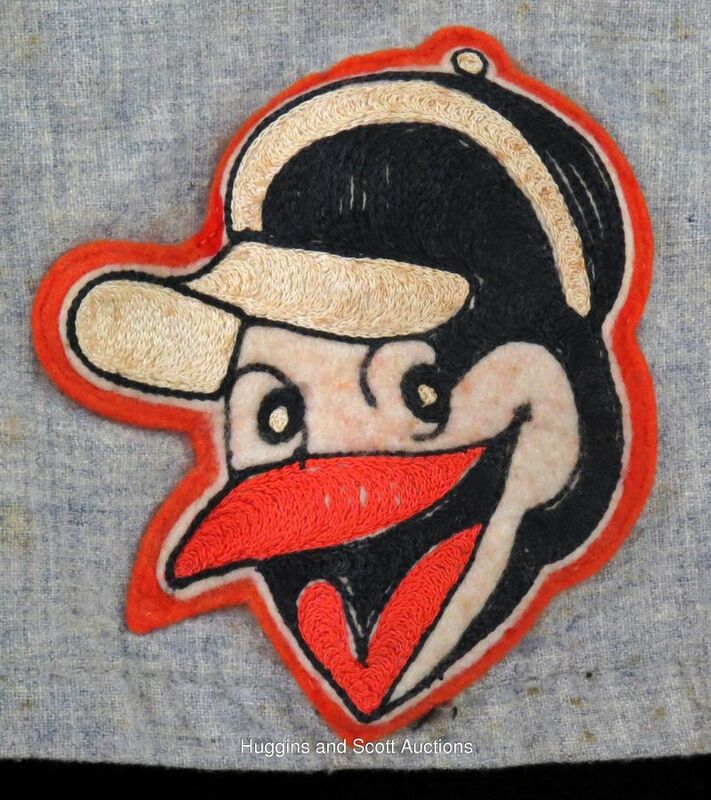 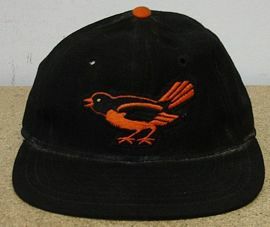 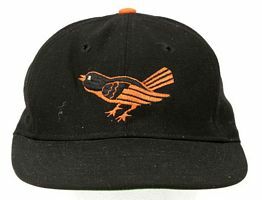 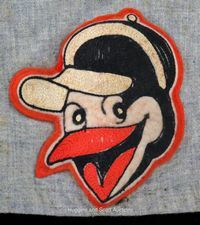 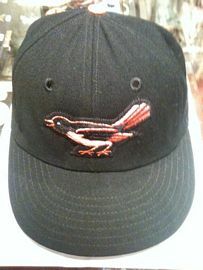 The St. Louis Browns became the Baltimore Orioles in 1954. 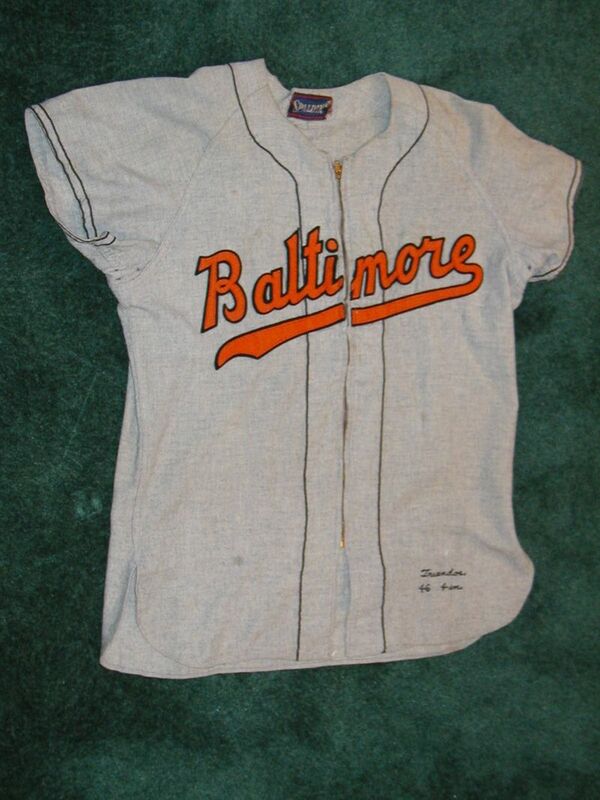 The new Orioles use converted 1952 and 1953 St. Louis Browns jerseys for their first spring training which explains the dearth of Browns jerseys in the hobby from those years. 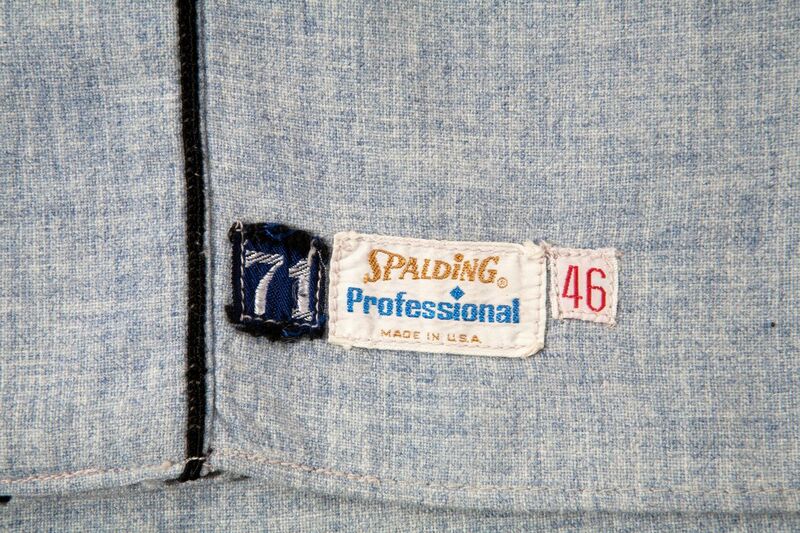 One year style. 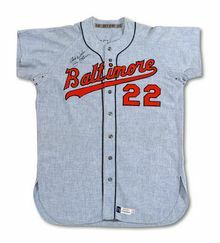 Players could choose zippered or buttoned jerseys. 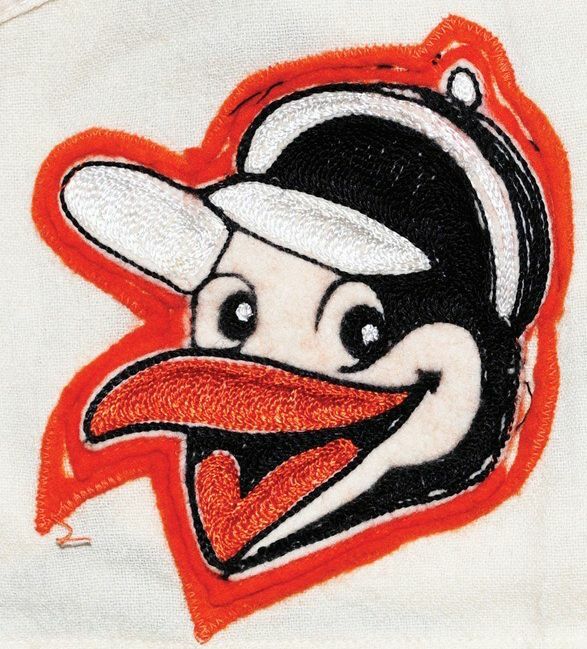 Script changes, zippered jerseys, piping added, Laughing Bird sleeve logo debuts. 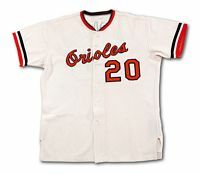 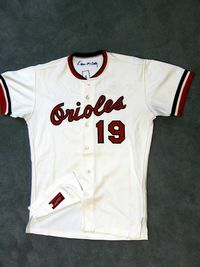 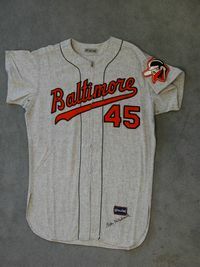 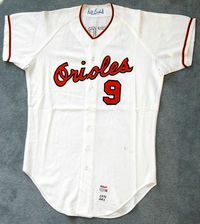 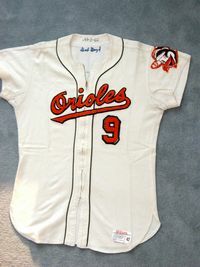 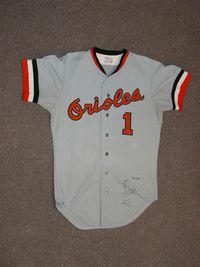 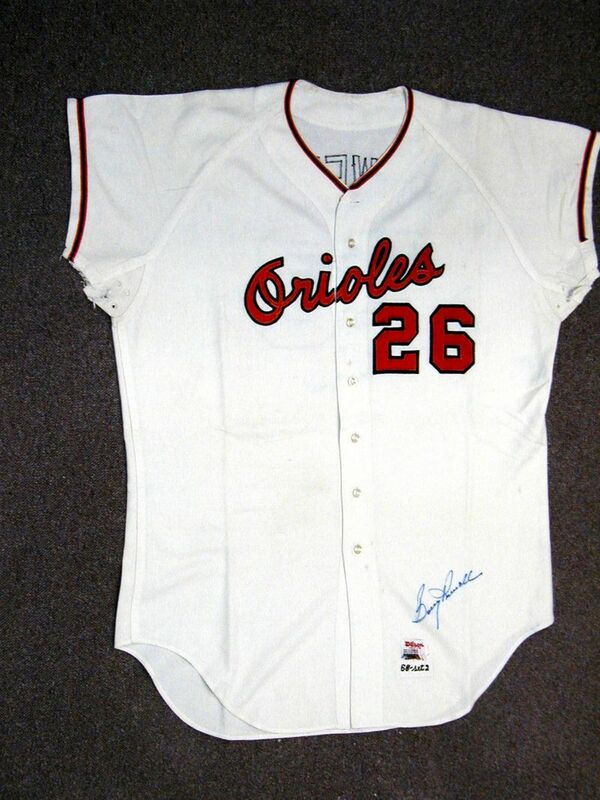 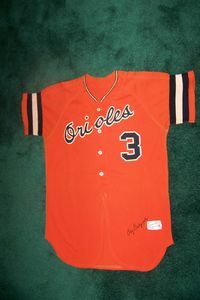 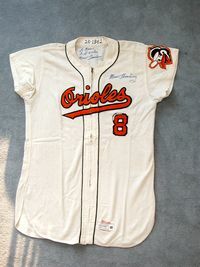 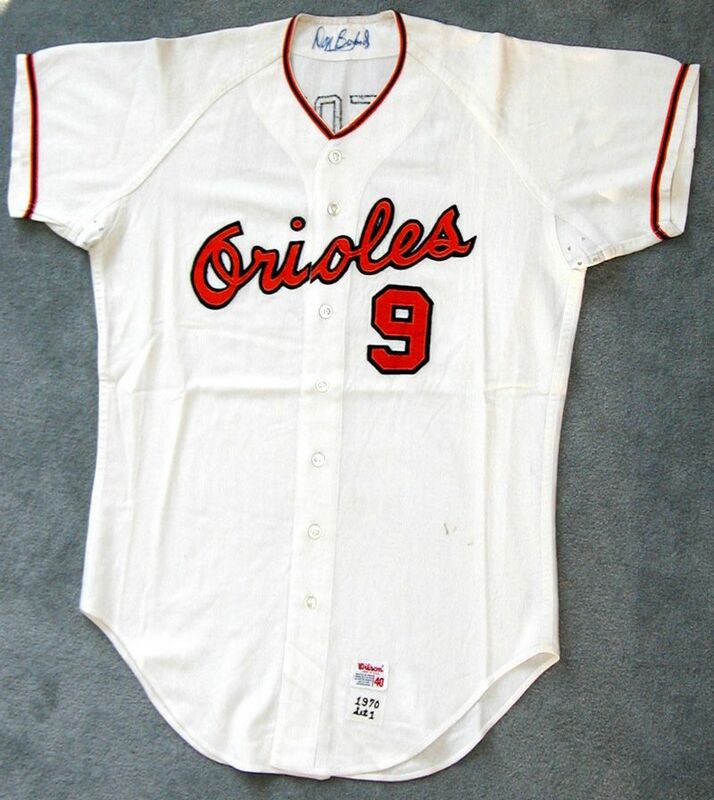 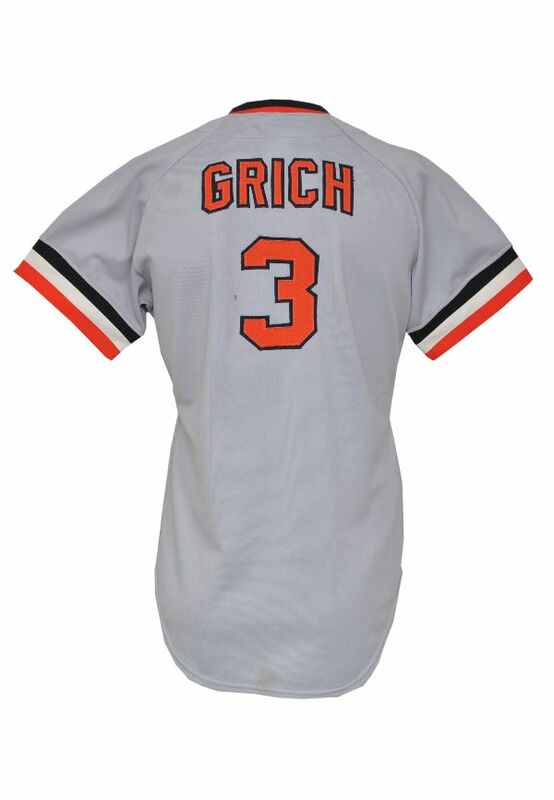 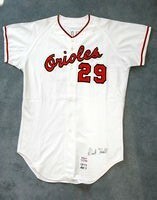 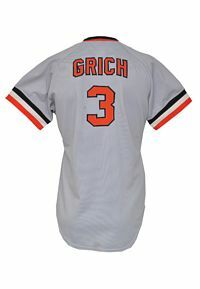 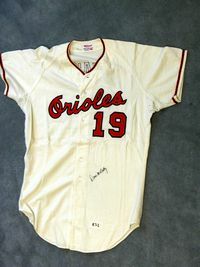 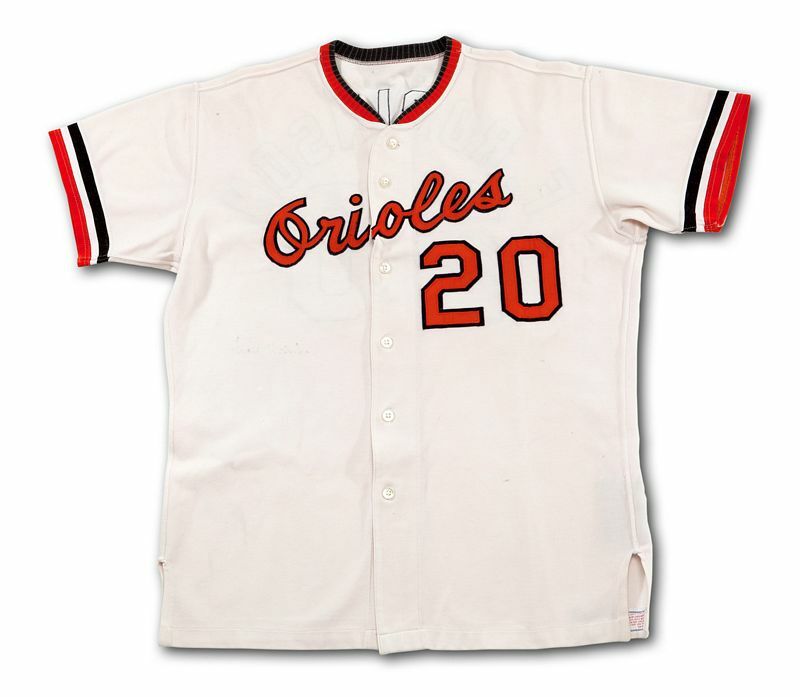 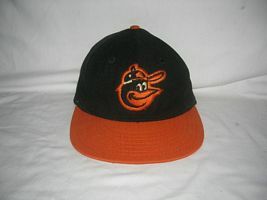 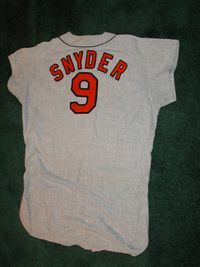 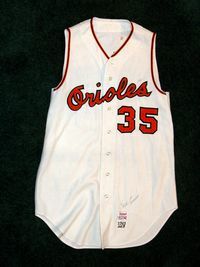 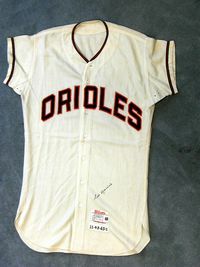 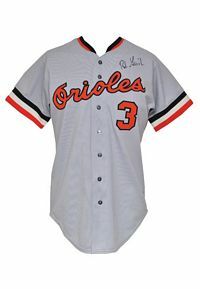 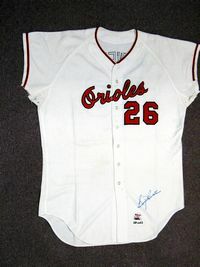 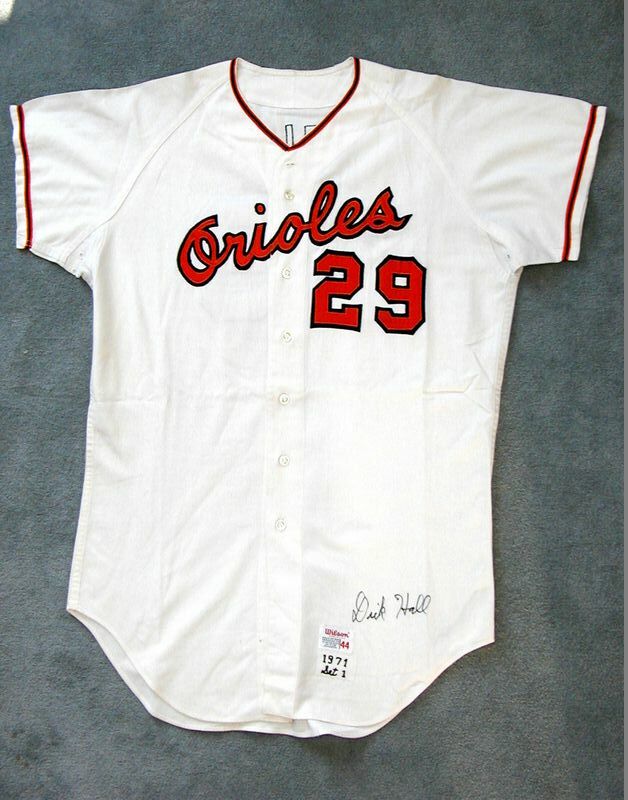 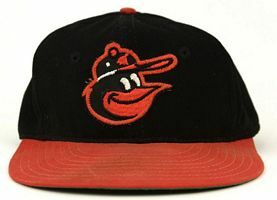 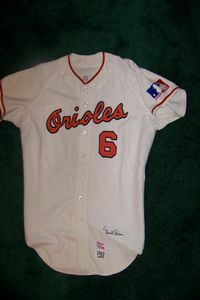 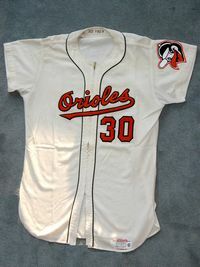 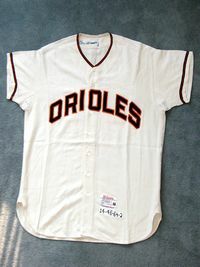 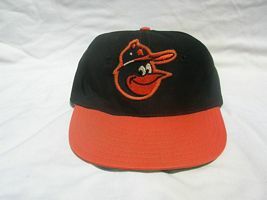 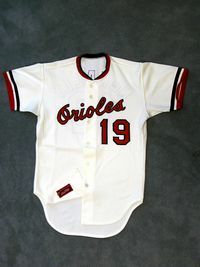 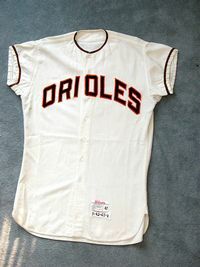 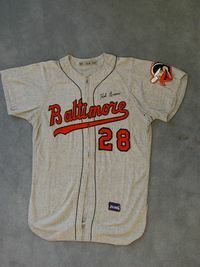 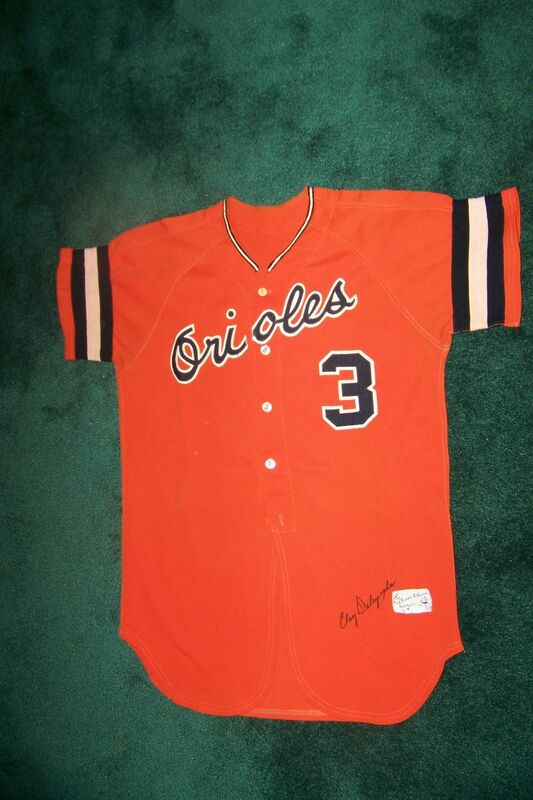 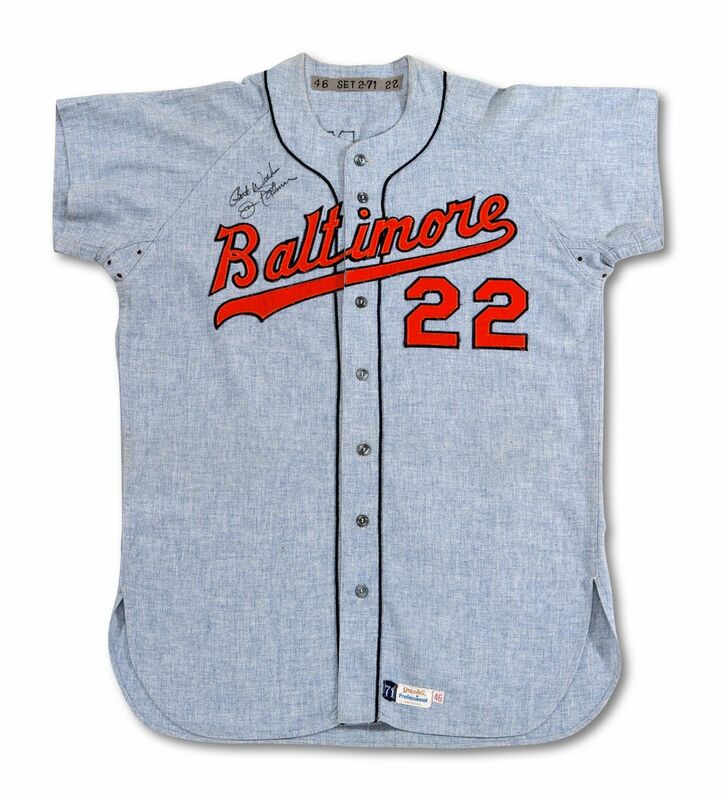 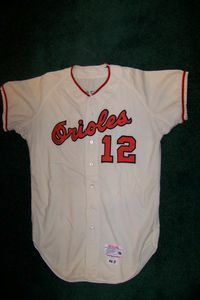 Road - Initially the O's wore "Orioles" script on road jerseys (anyone have one?). 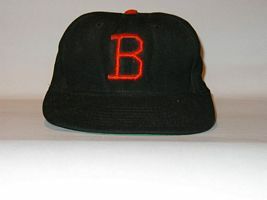 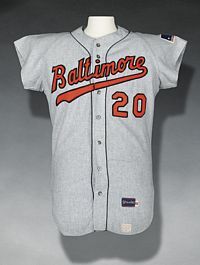 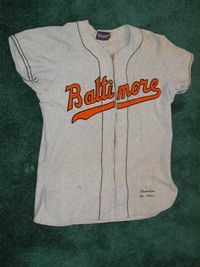 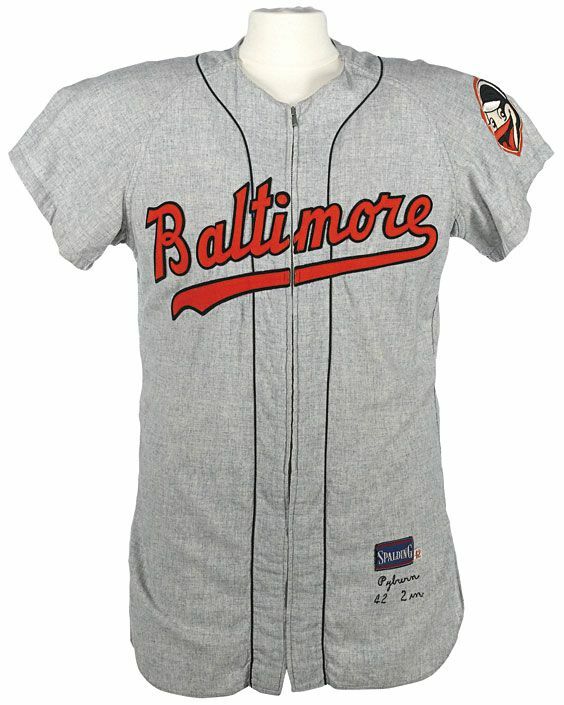 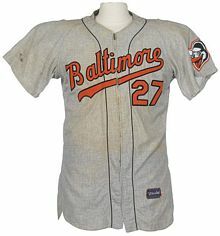 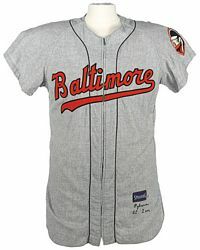 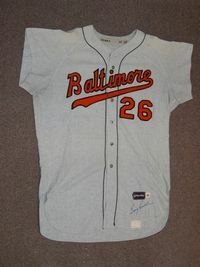 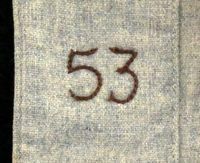 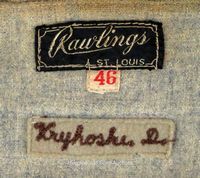 It was changed to "Baltimore" script during the 1955 season. 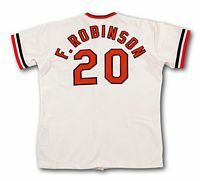 The HOF database missed this. 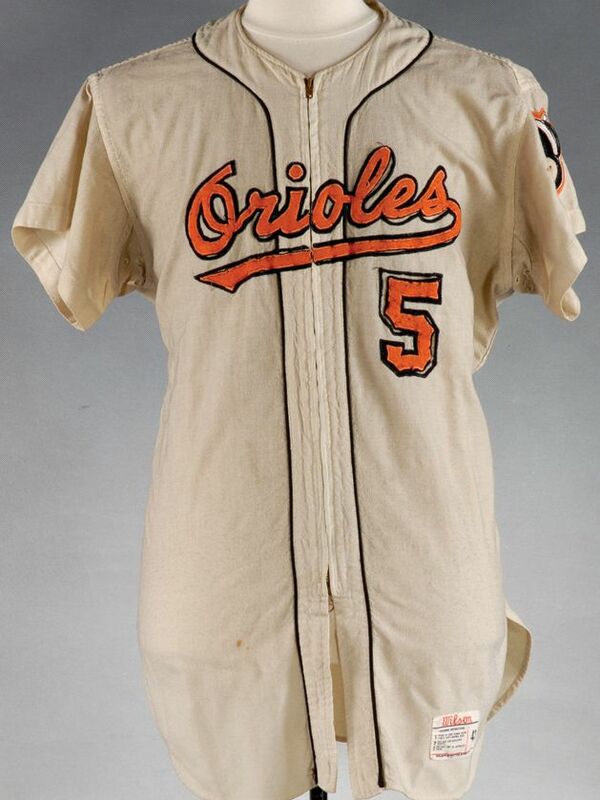 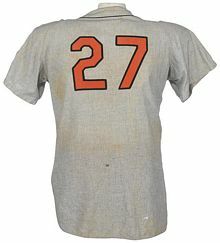 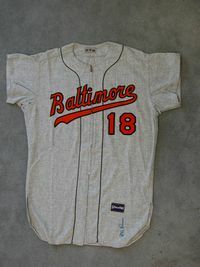 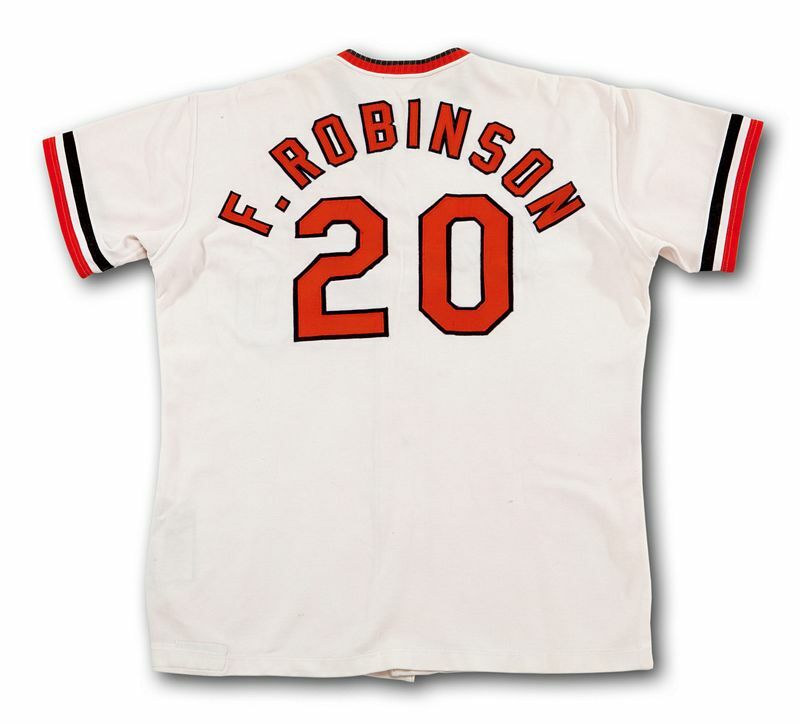 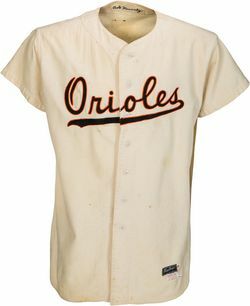 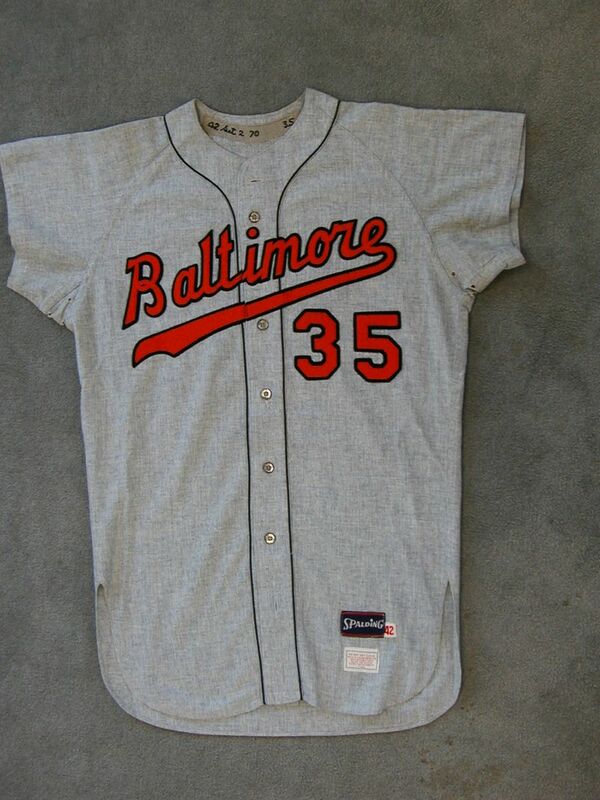 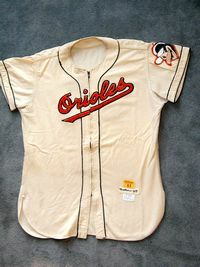 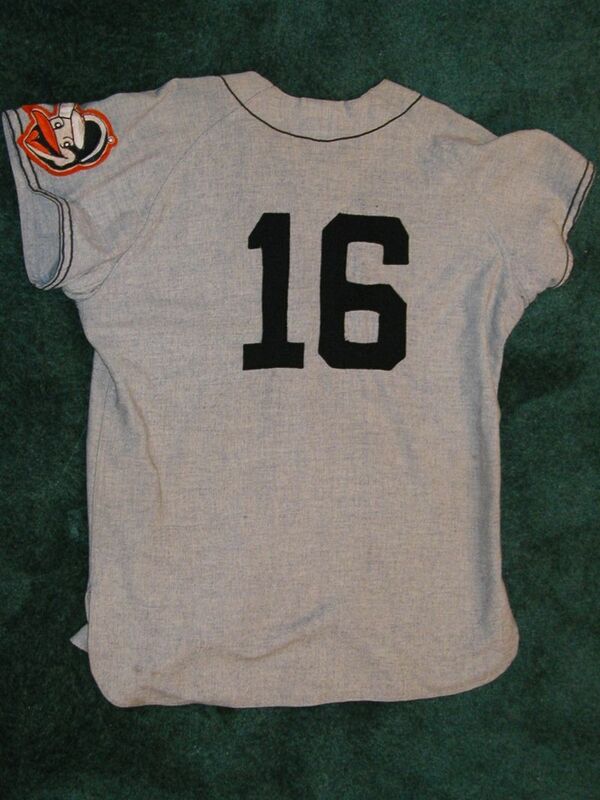 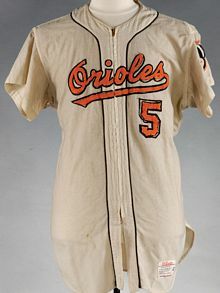 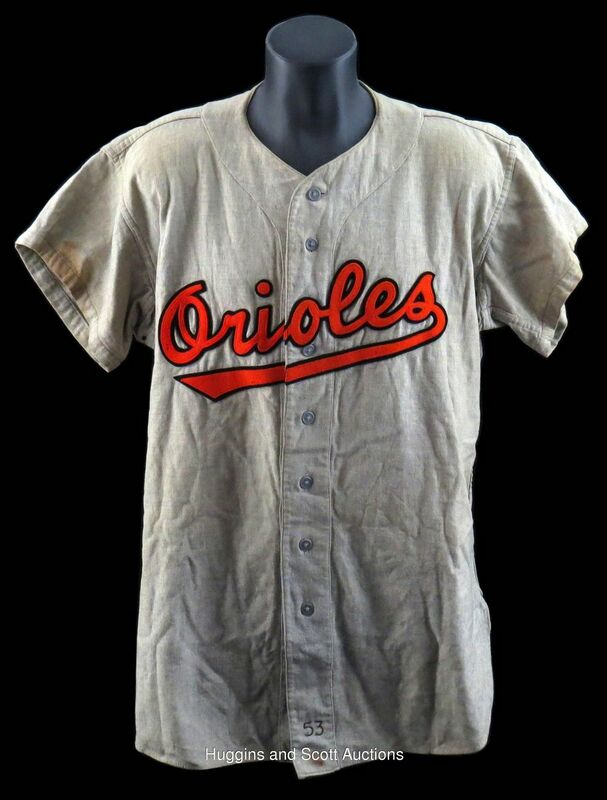 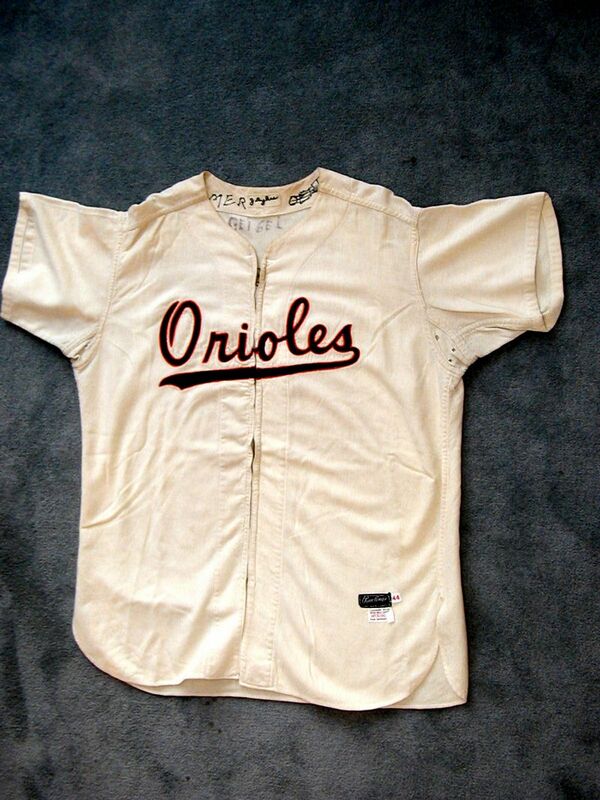 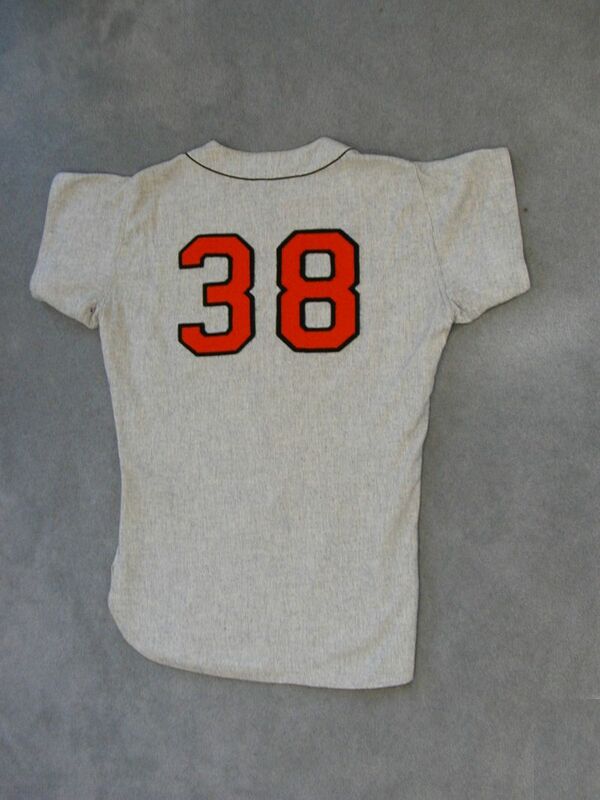 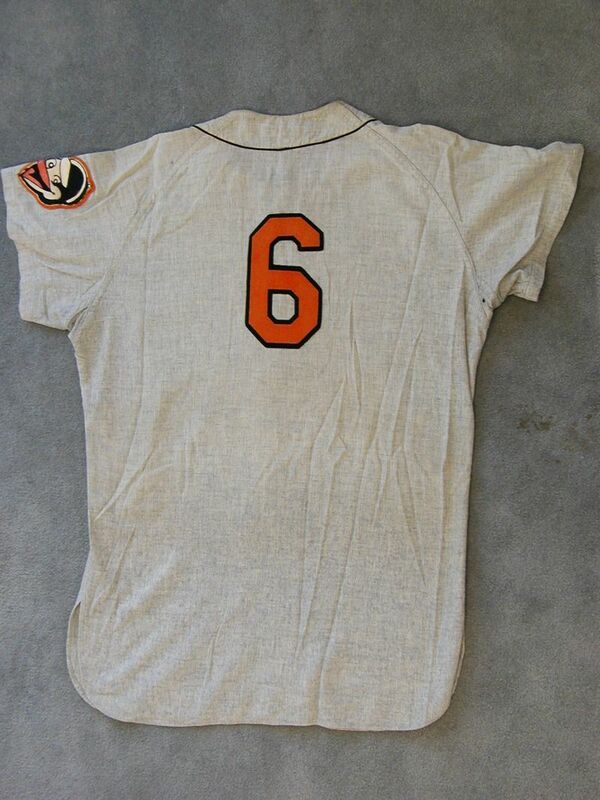 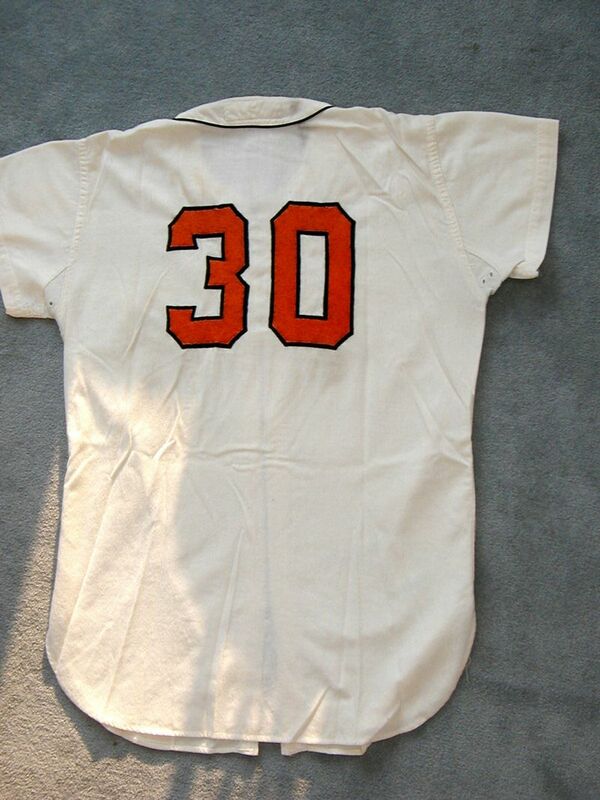 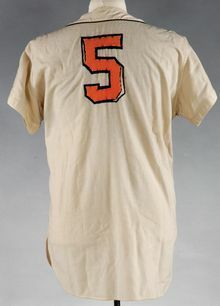 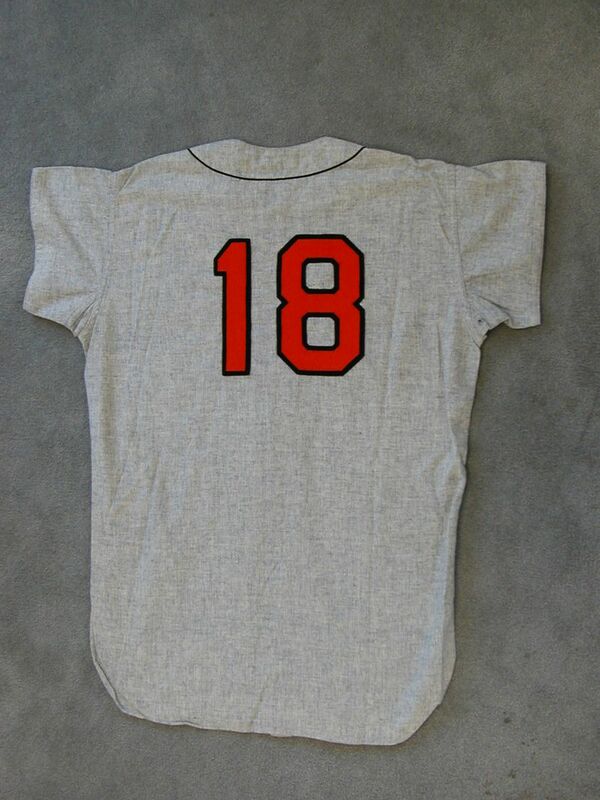 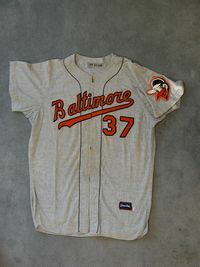 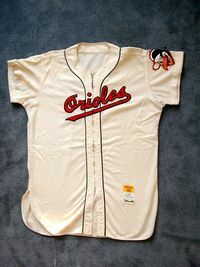 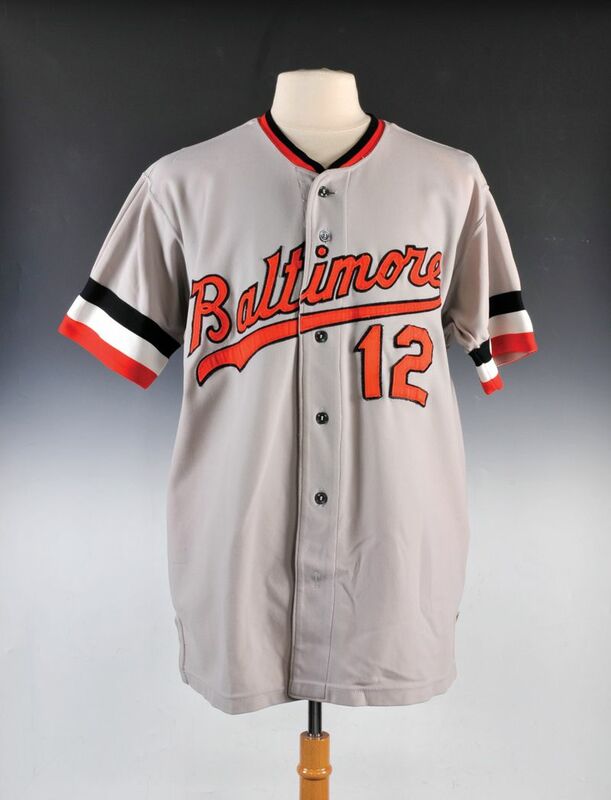 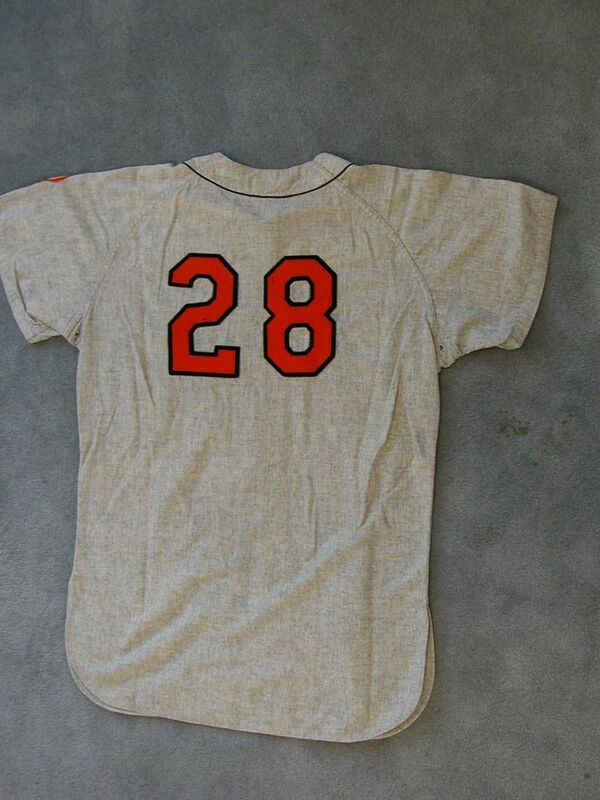 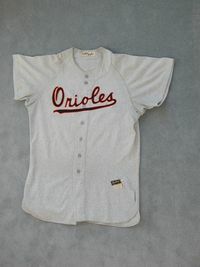 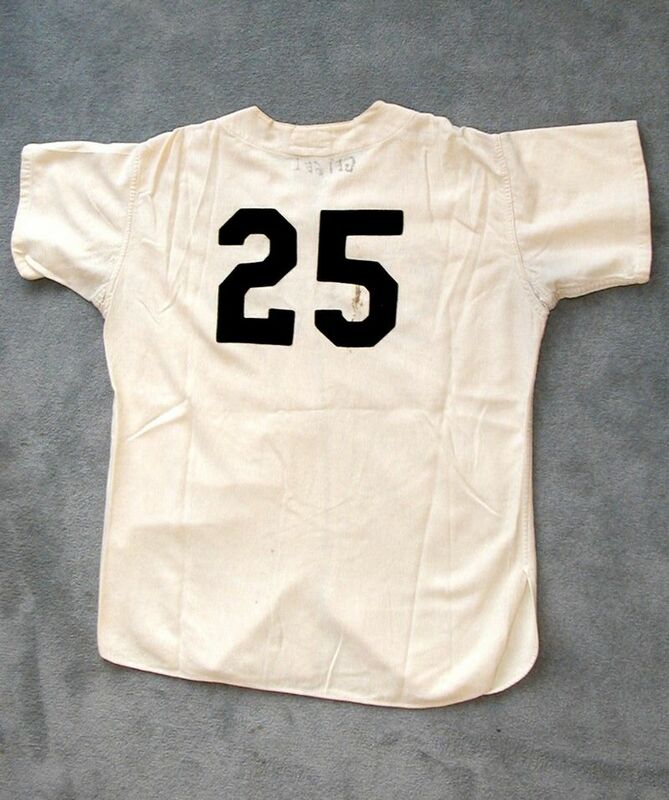 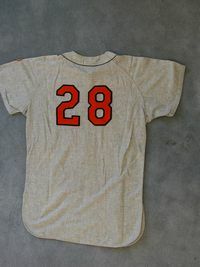 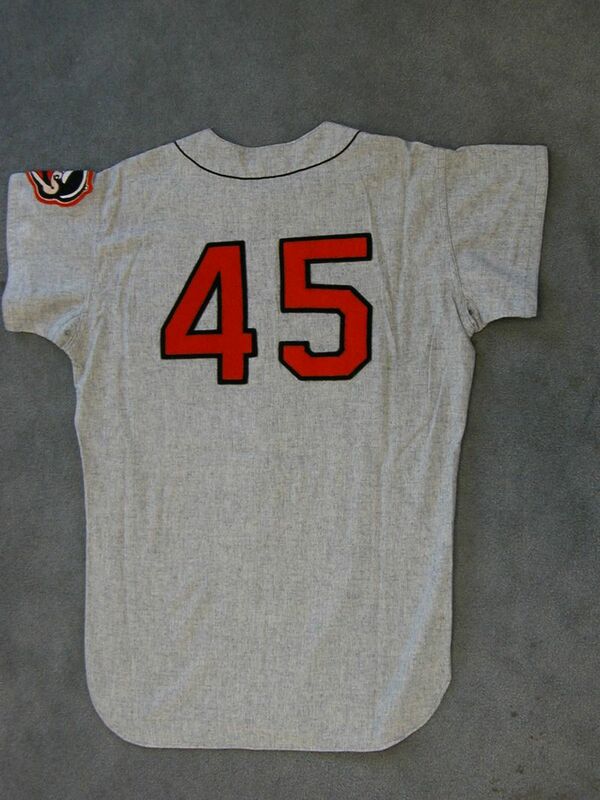 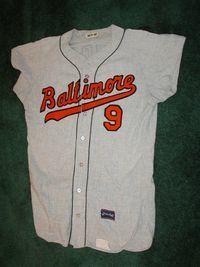 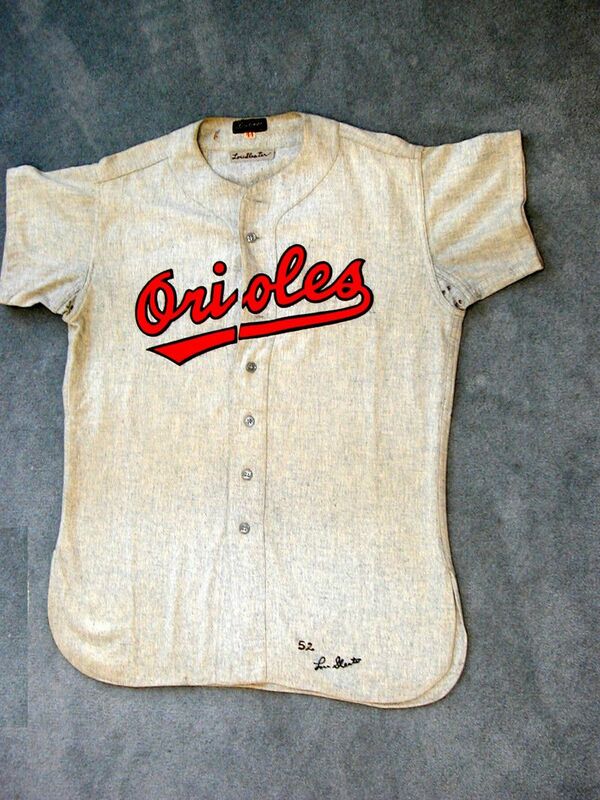 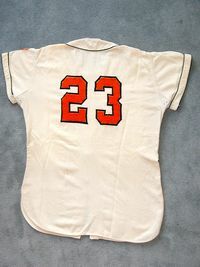 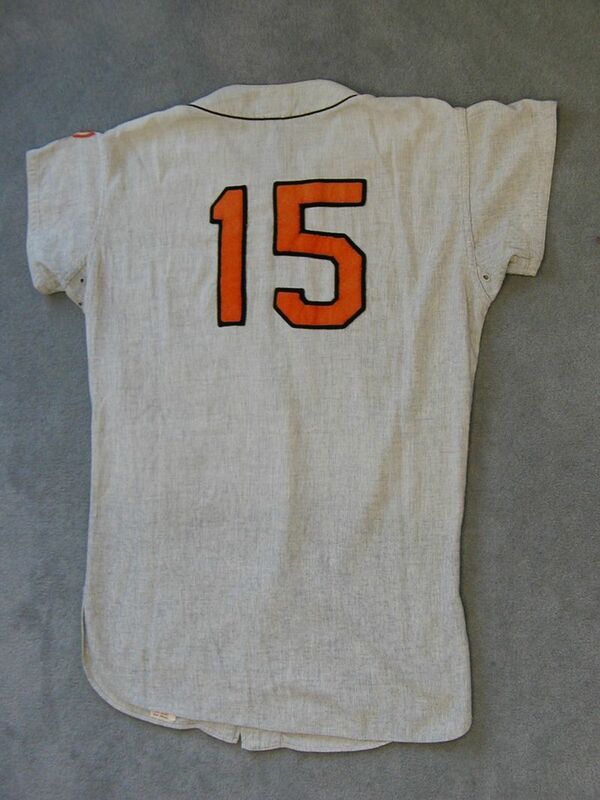 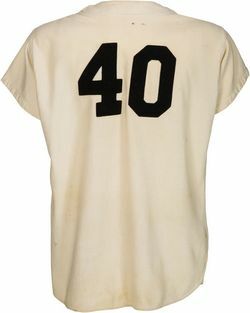 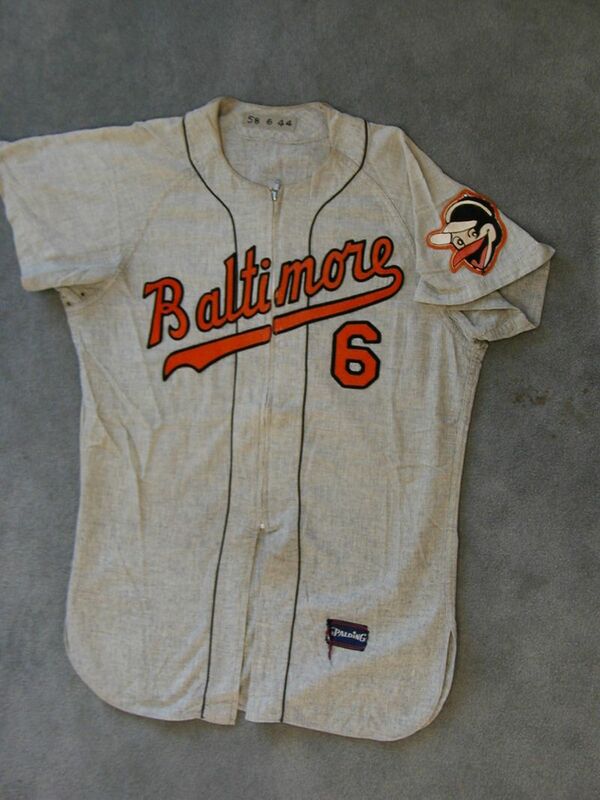 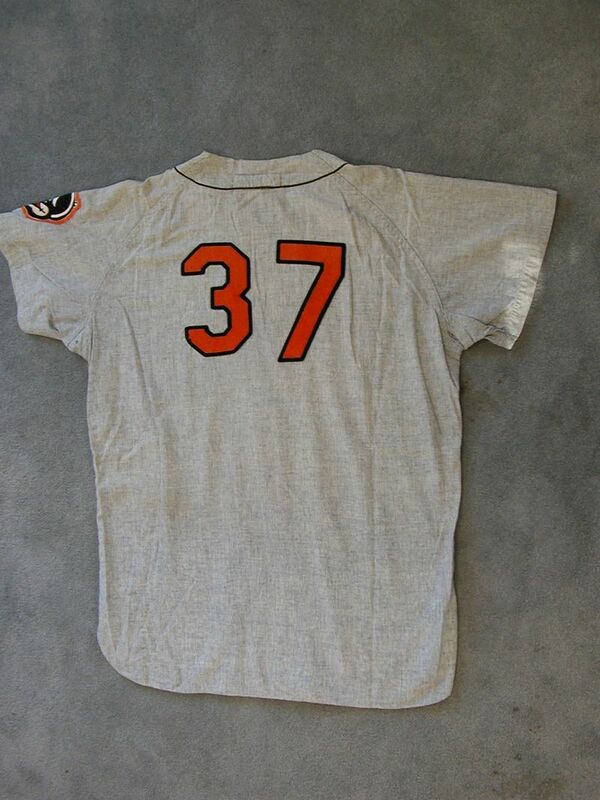 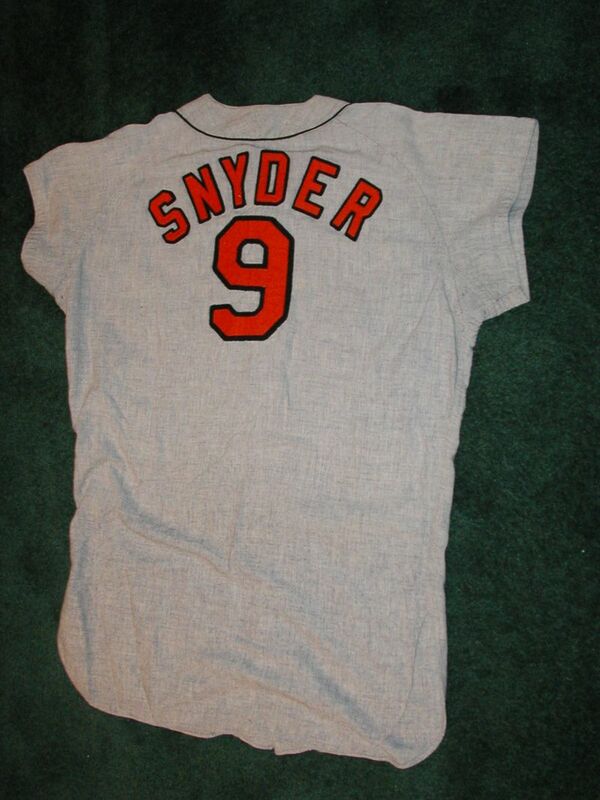 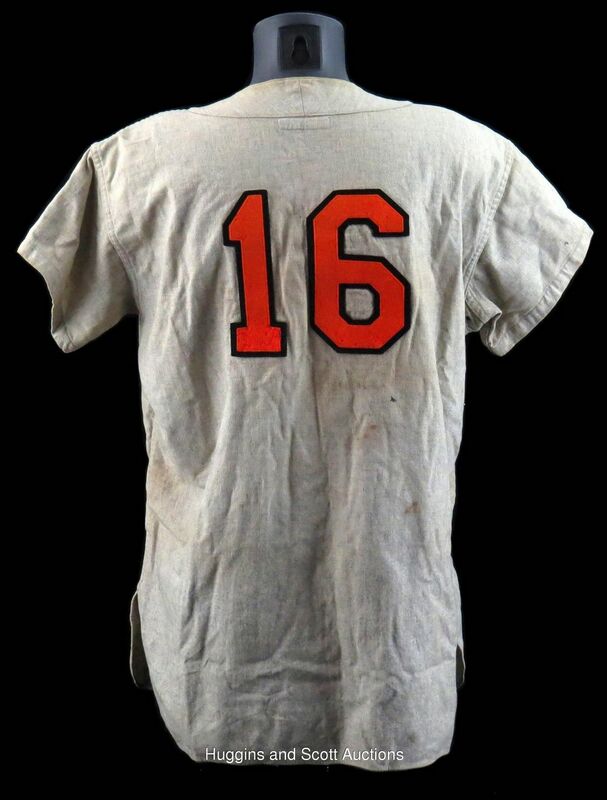 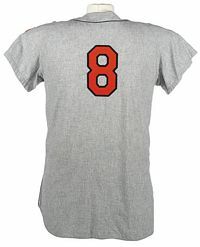 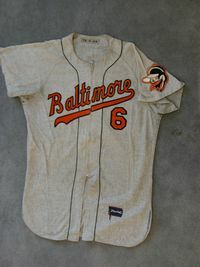 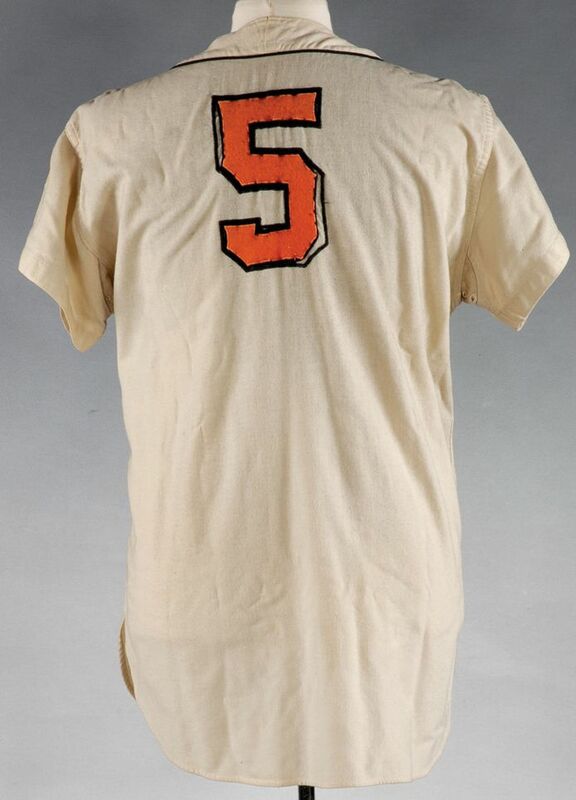 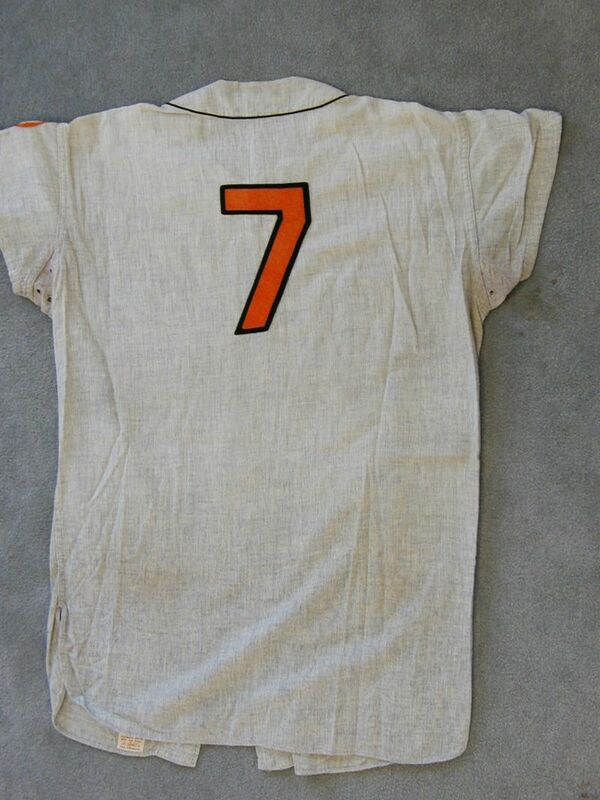 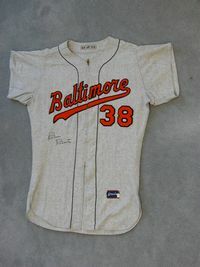 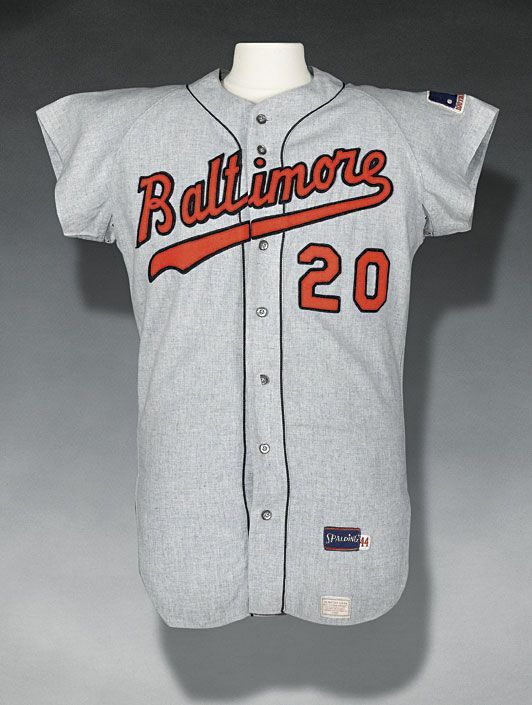 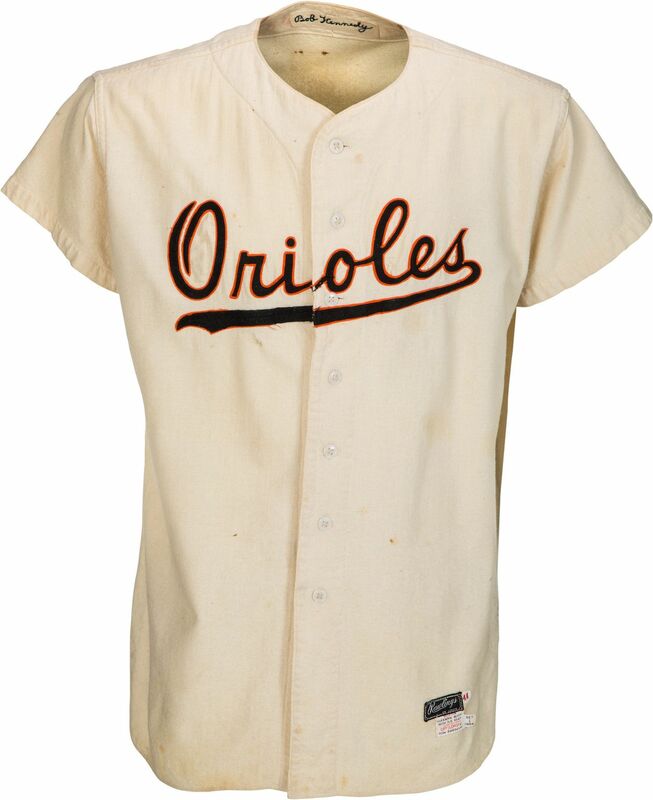 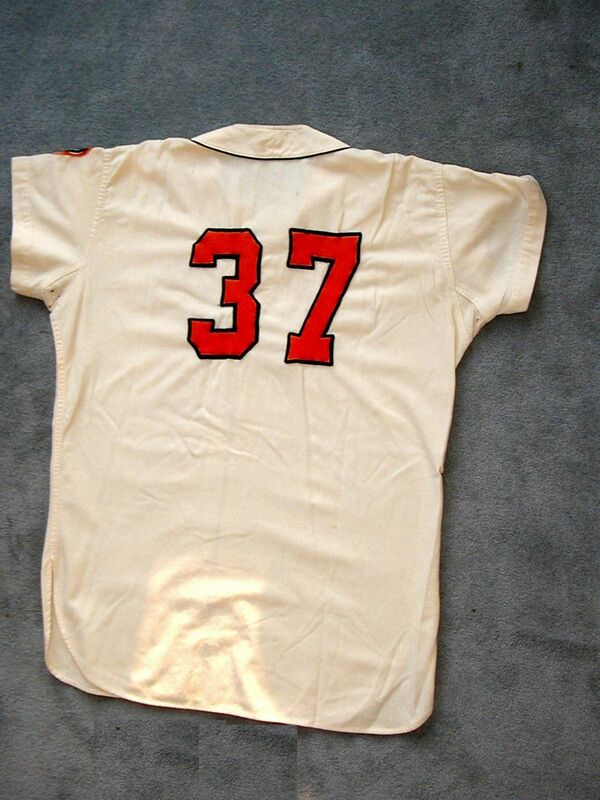 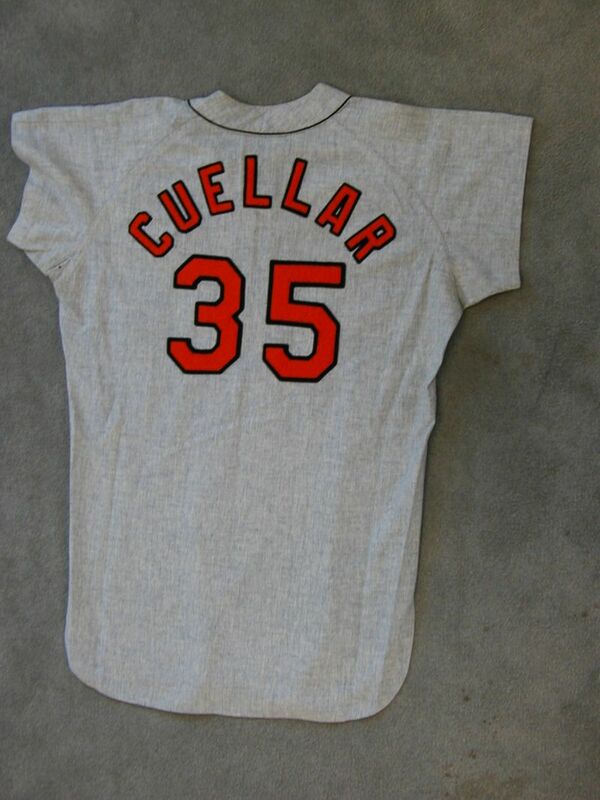 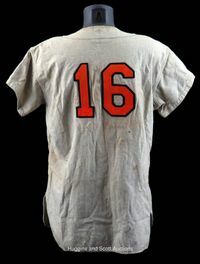 While these 1957 jerseys have numbers on the front, the Orioles started the season without them. 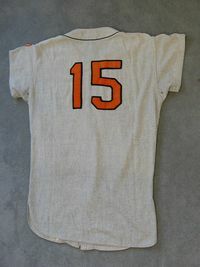 I'm not sure if front numbers were added during the season, for reuse in 1958, or for reuse in the minors. 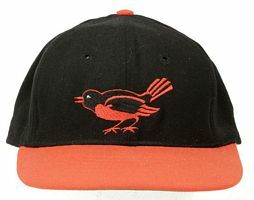 If anyone knows, let me know! 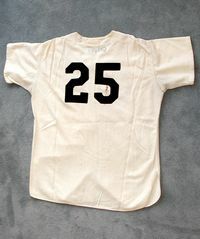 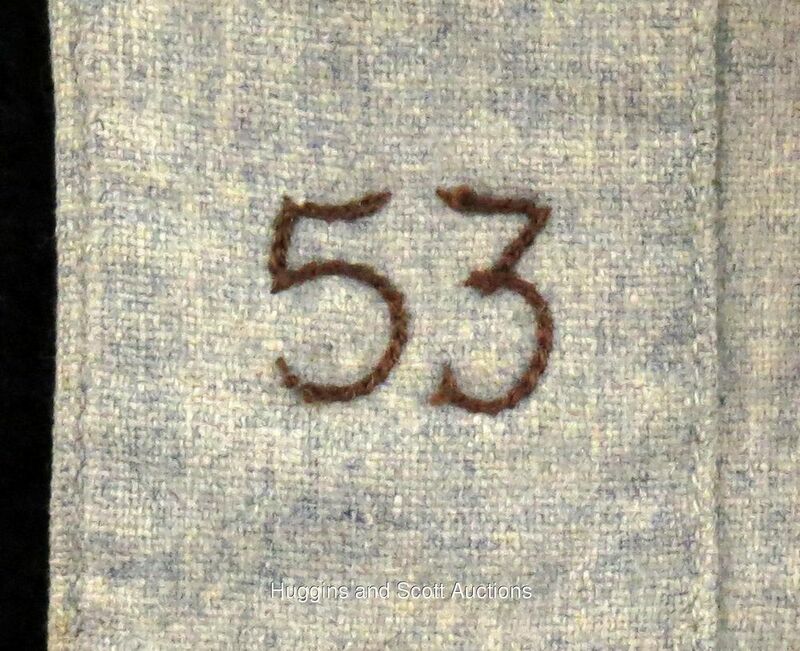 Numbers added to front of jerseys (might have happened during 1957). 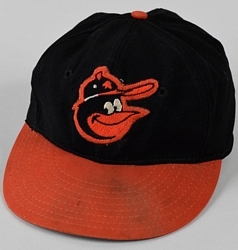 Caps get orange visors. Home jerseys get a makeover, and has buttons and no sleeve logo. 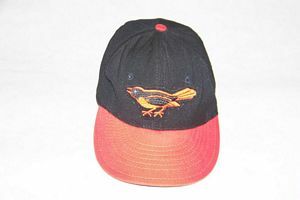 New caps are introduced. 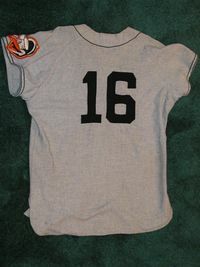 Sleeve logo dropped on road jerseys, same cap now worn home and road. The Cartoon Bird make his debut, home jerseys get a redesign, zippers are gone from road jerseys, names on back debut. 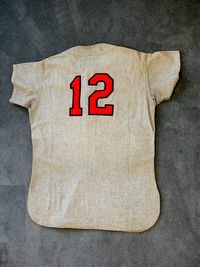 An alternate sleeveless vest is worn at home. 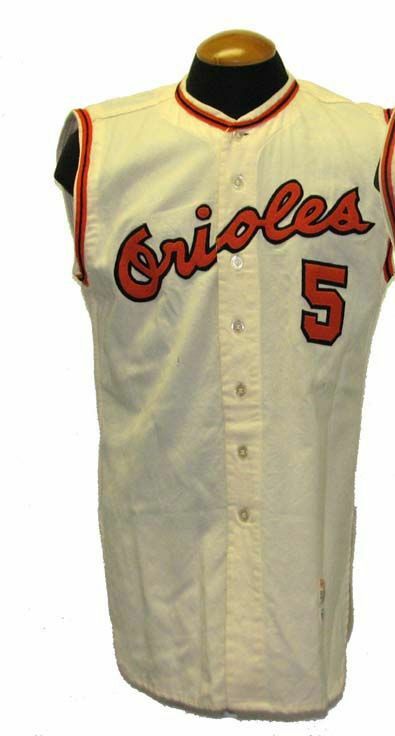 The sleeveless vest is dropped. 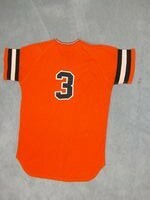 This wool flannel jersey was alternated with the new double knit poly jersey till mid season 1971 then retired. 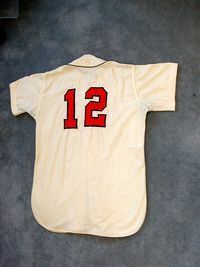 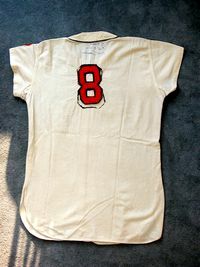 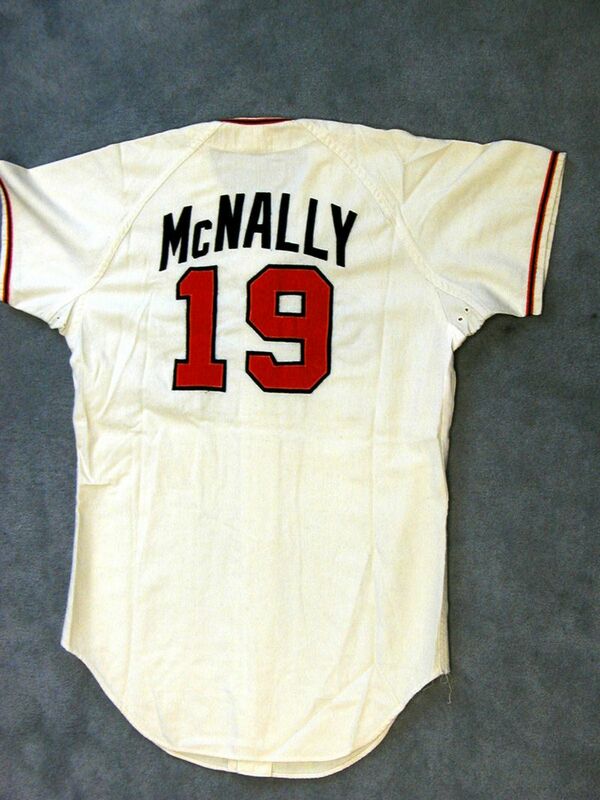 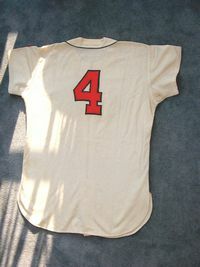 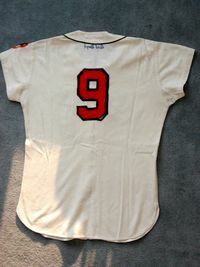 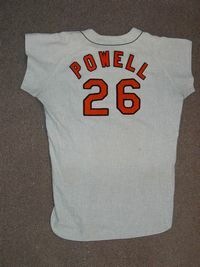 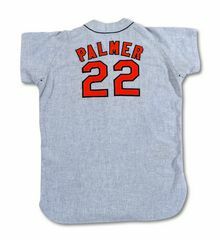 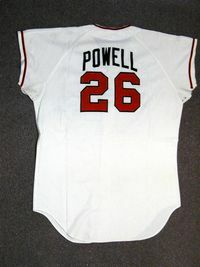 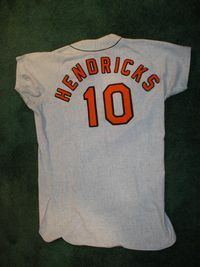 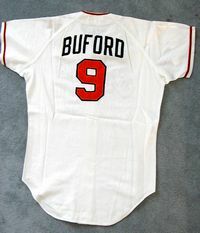 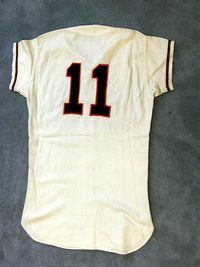 This road jersey was worn throughout the 1971 regular season, but retired before the playoffs. 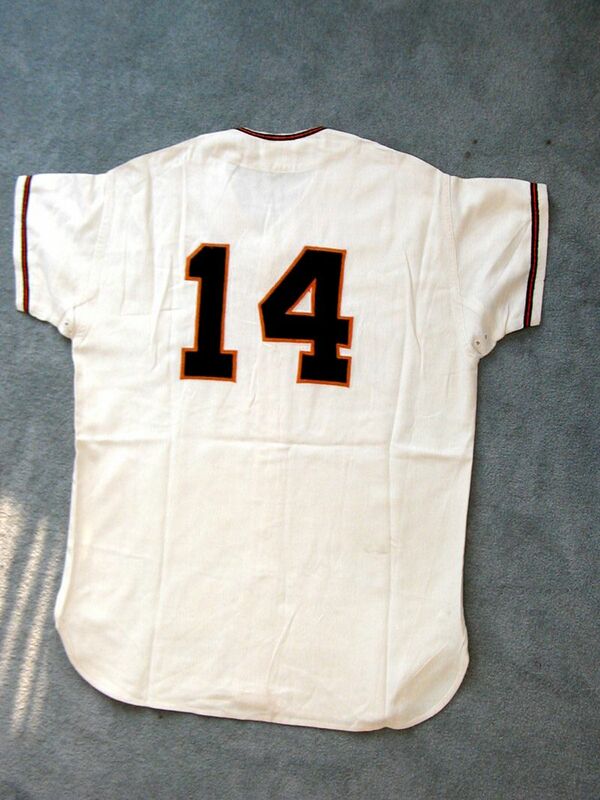 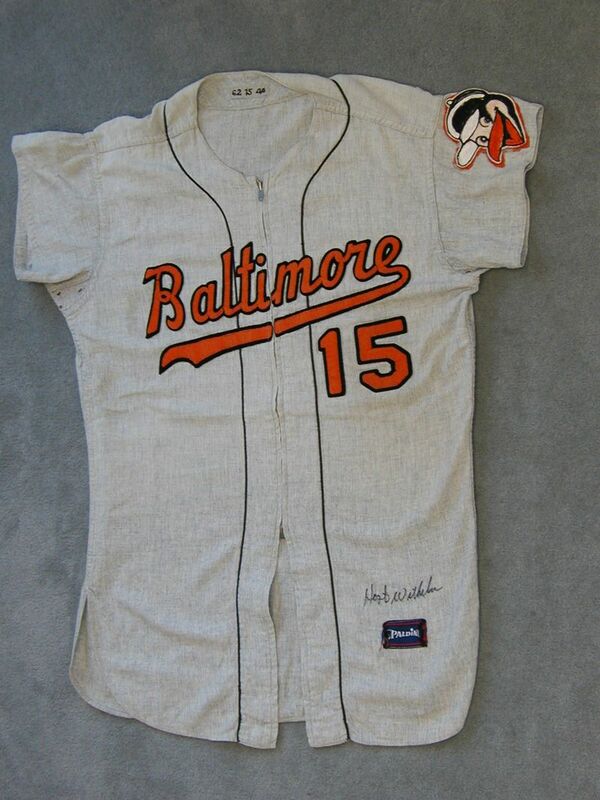 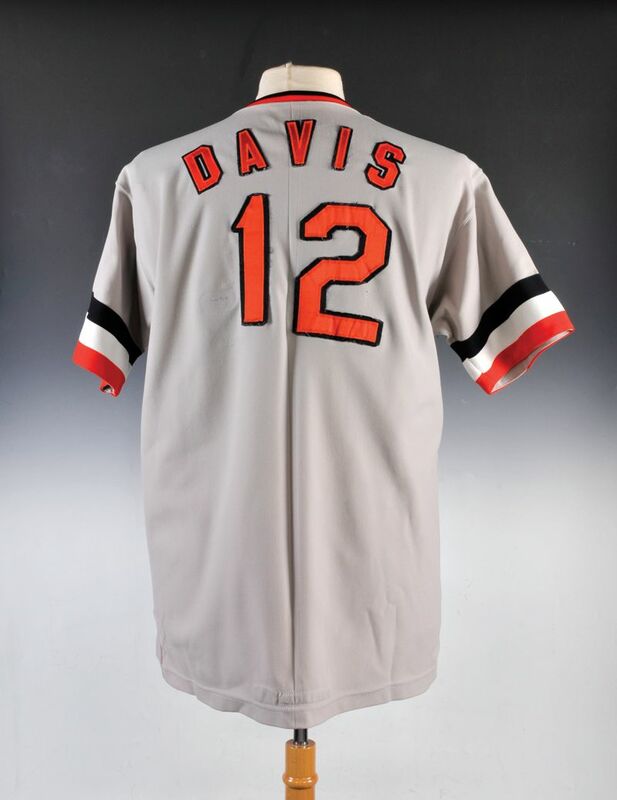 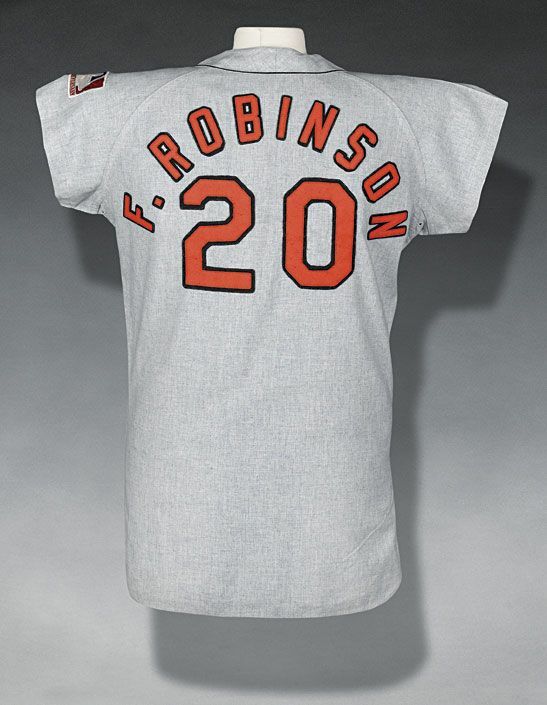 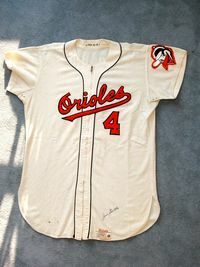 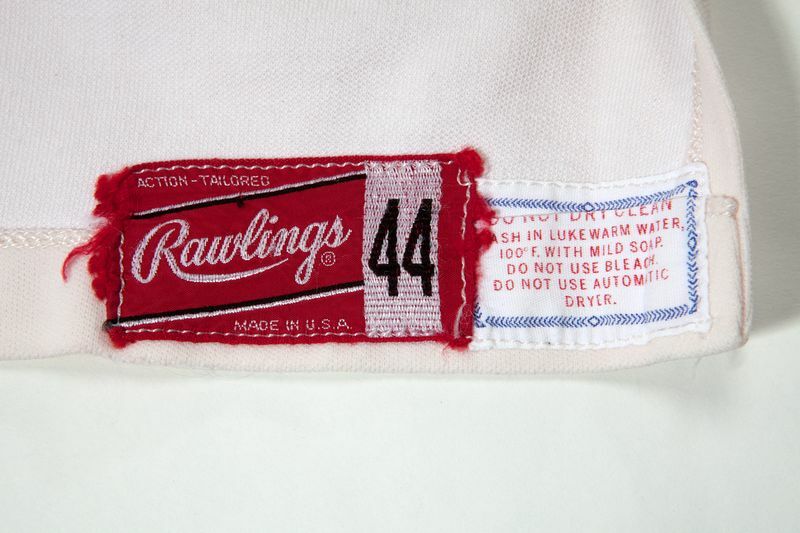 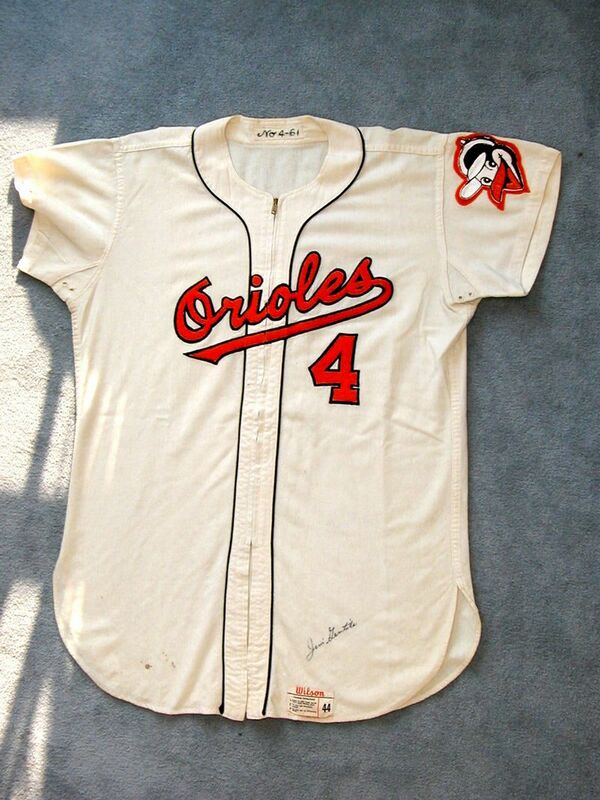 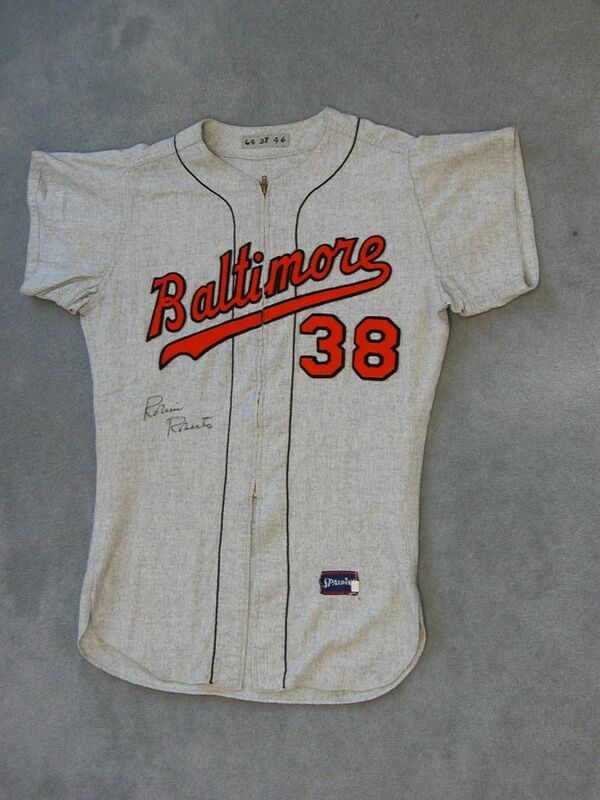 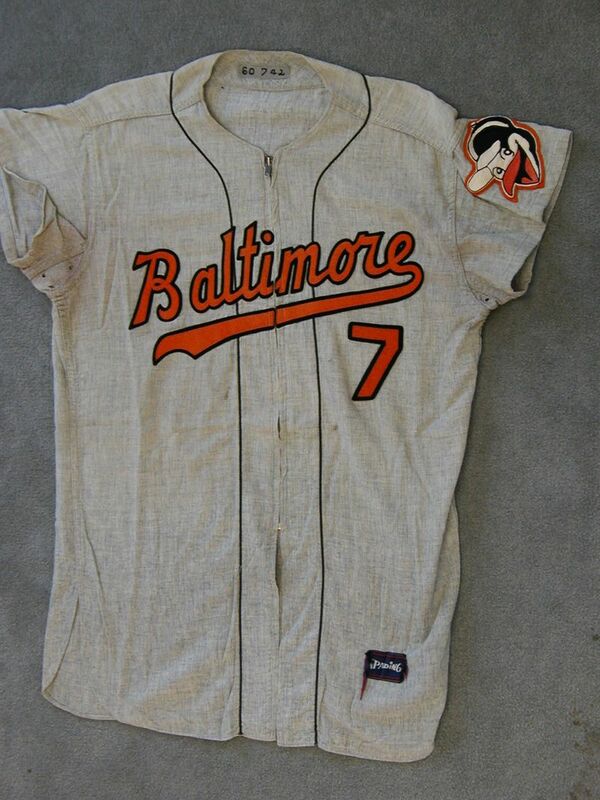 Designed by Brooks Robinson, this beauty was worn twice in Sept. 1971 and once on April 22, 1972. 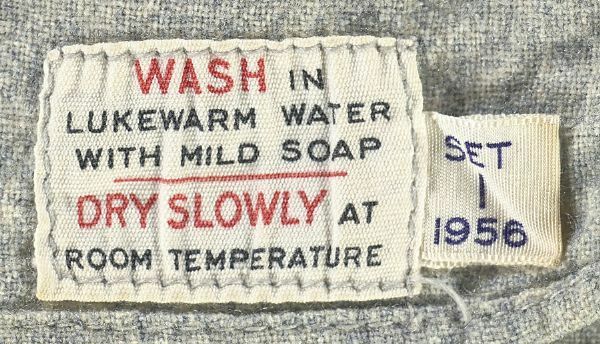 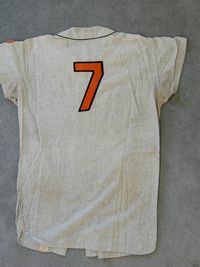 Worn with orange pants. 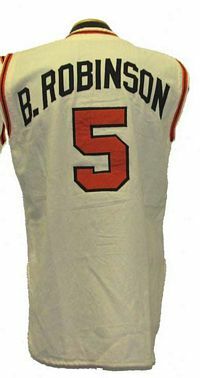 I'm sure Brooks also had orange shag carpet throughout his house. 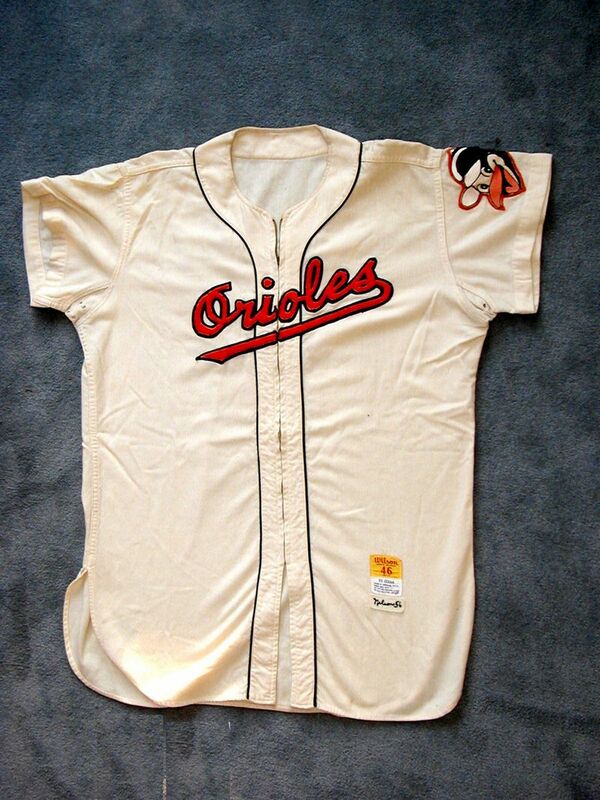 The Orioles break out their new Spalding double knit poly road jerseys for the 1971 playoffs. 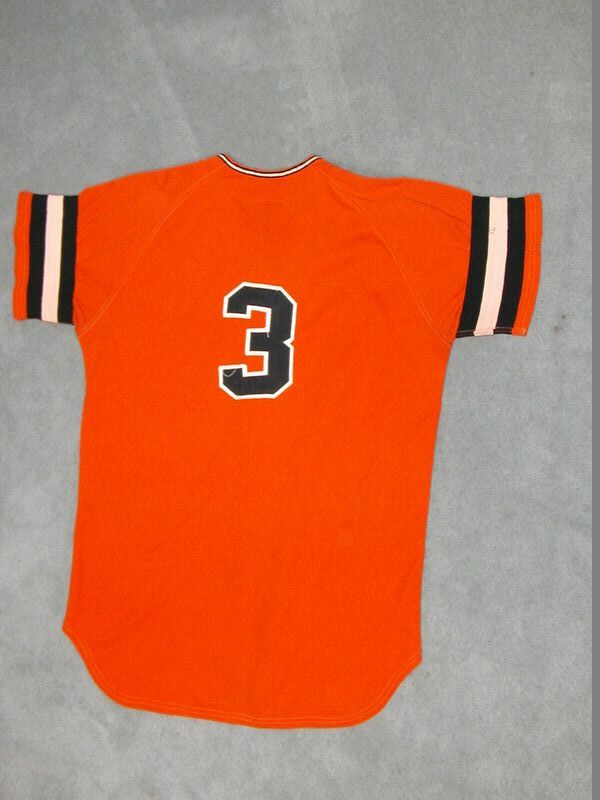 It had an orange-white-black striped sleeve cuff. 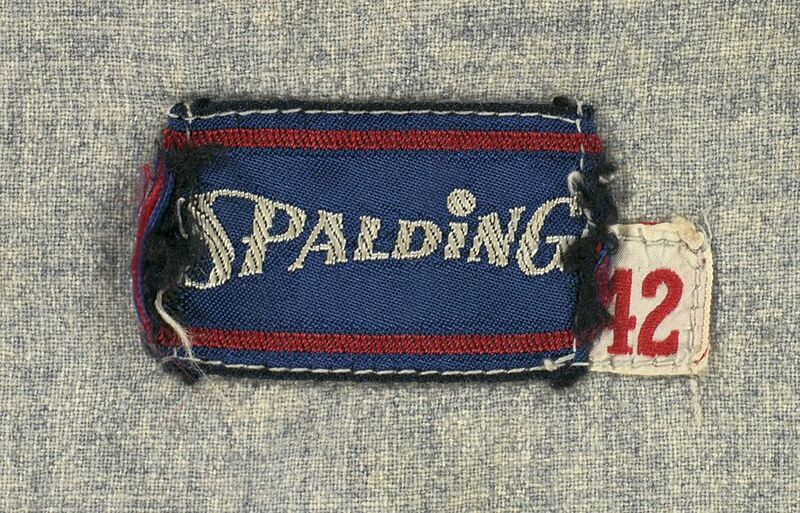 When the same Spalding jerseys appeared at the start of the 1972 season, sleeve cuffs had the opposite black-white-orange stripe pattern. 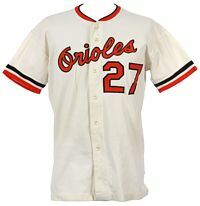 Anyone have a 1971 jersey? 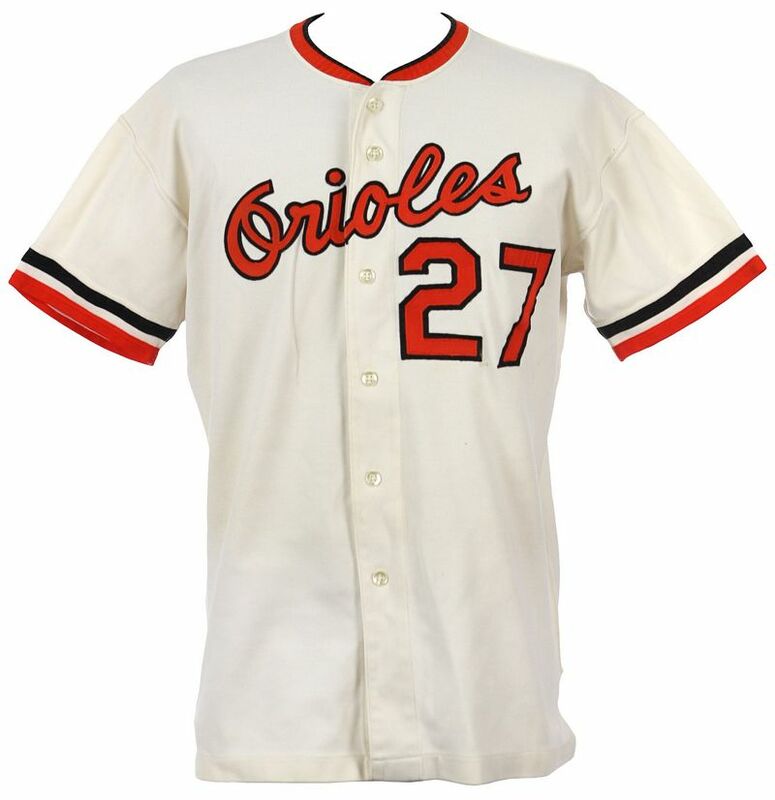 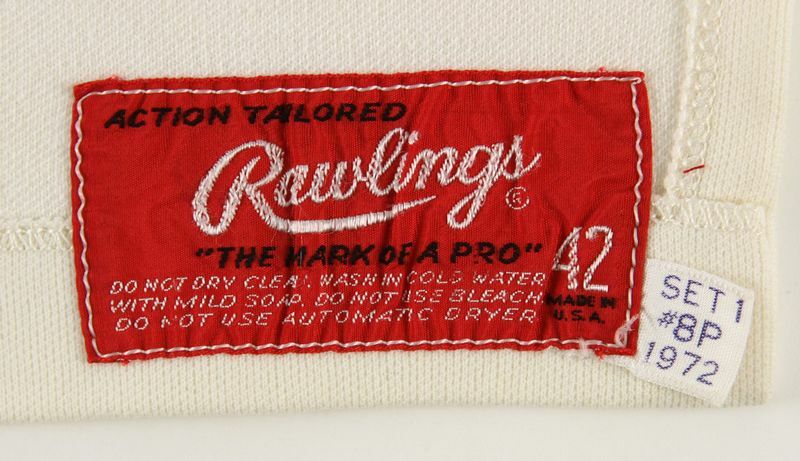 I haven't seen any, and my suspicion is that they were a manufacturing mistake, that the jerseys were returned after the '71 playoffs to have the striped sleeve cuffs removed and sewn back on the correct way for the '72 season. 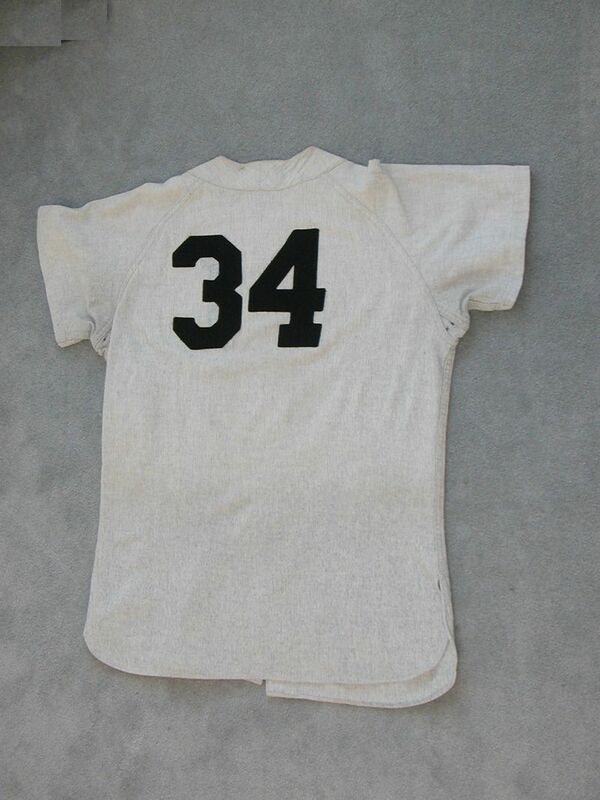 See the 1972 road jersey below. 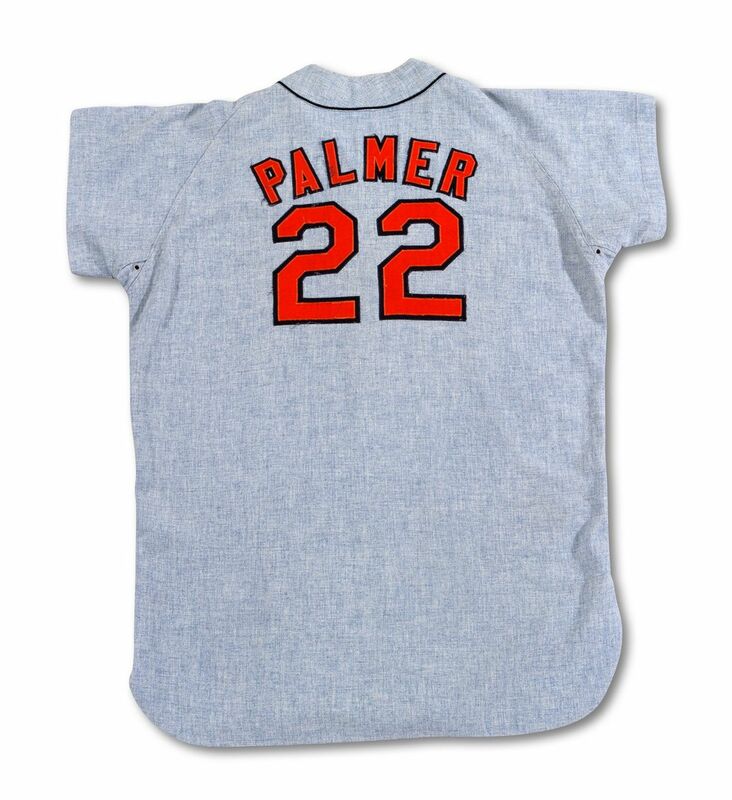 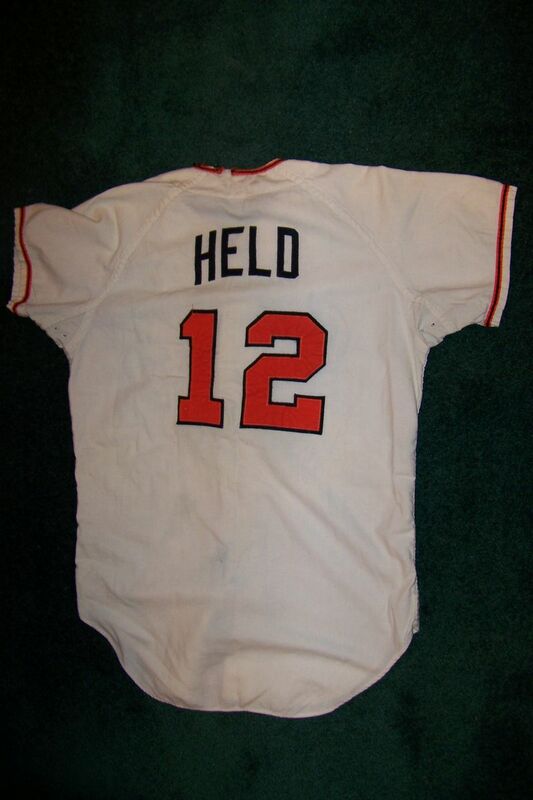 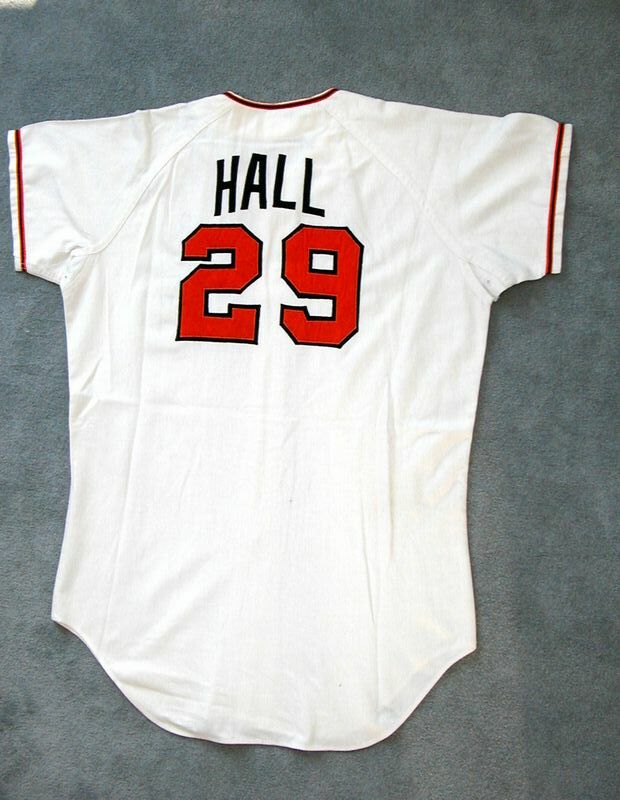 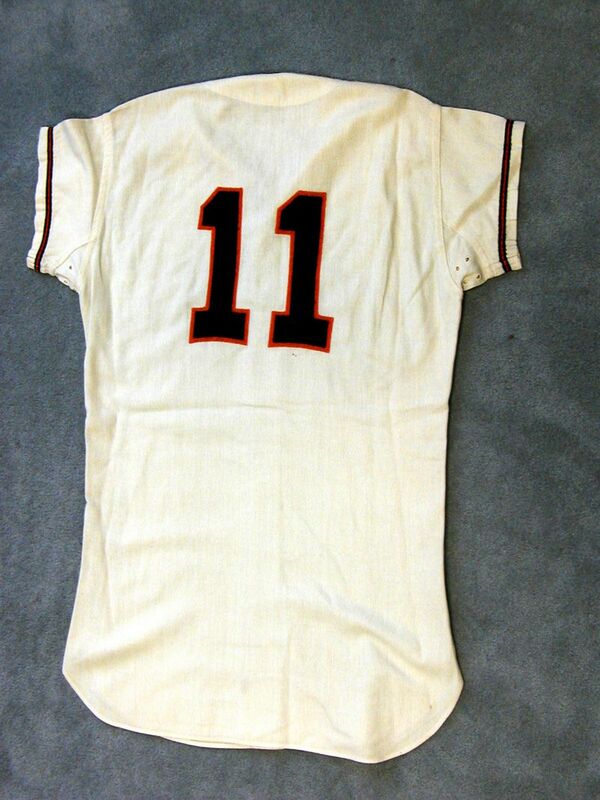 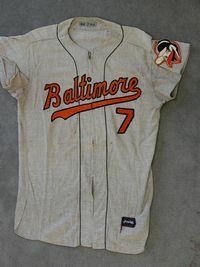 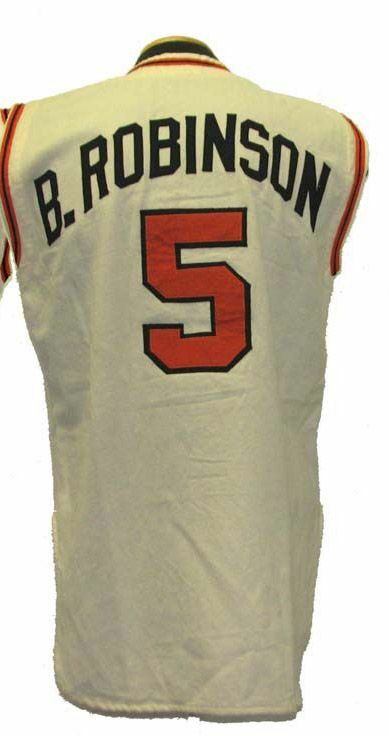 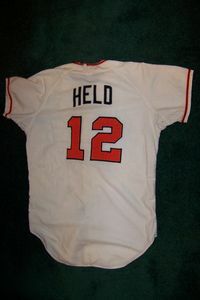 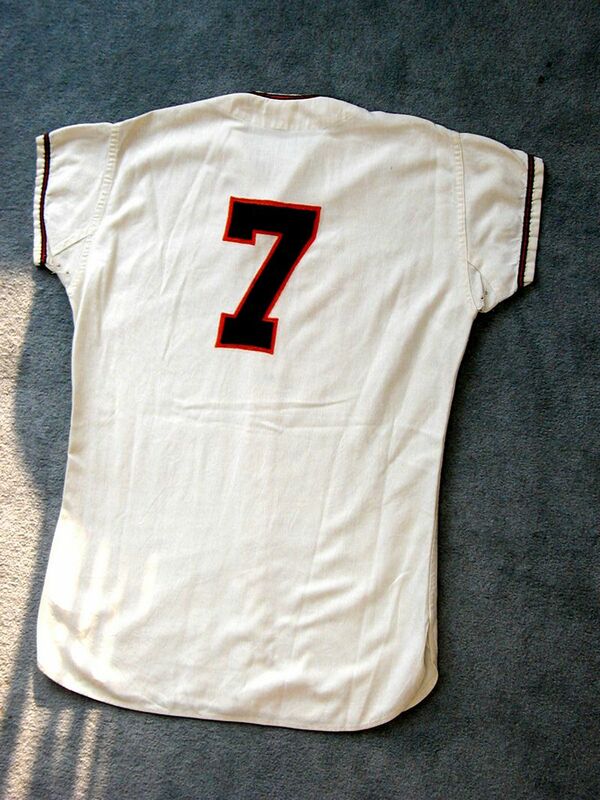 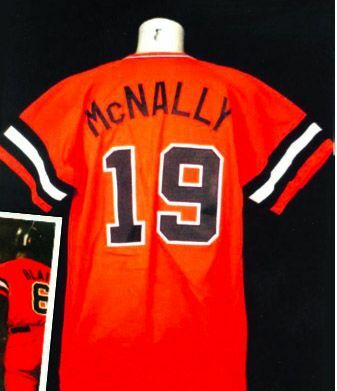 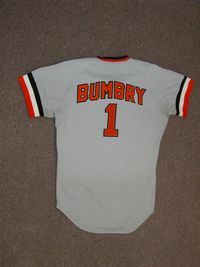 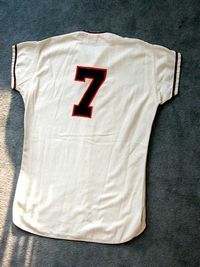 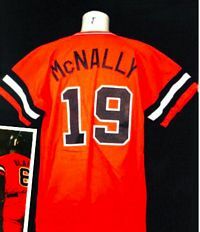 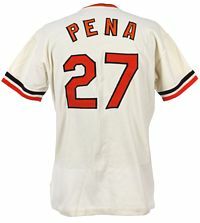 Unlike the road jersey with orange-white-black sleeve cuffs used in the 1971 playoffs, the 1972 road jersey has black-white-orange sleeve cuffs (matching the home jersey). 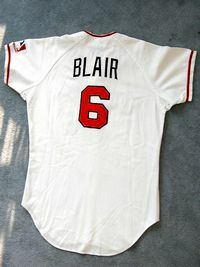 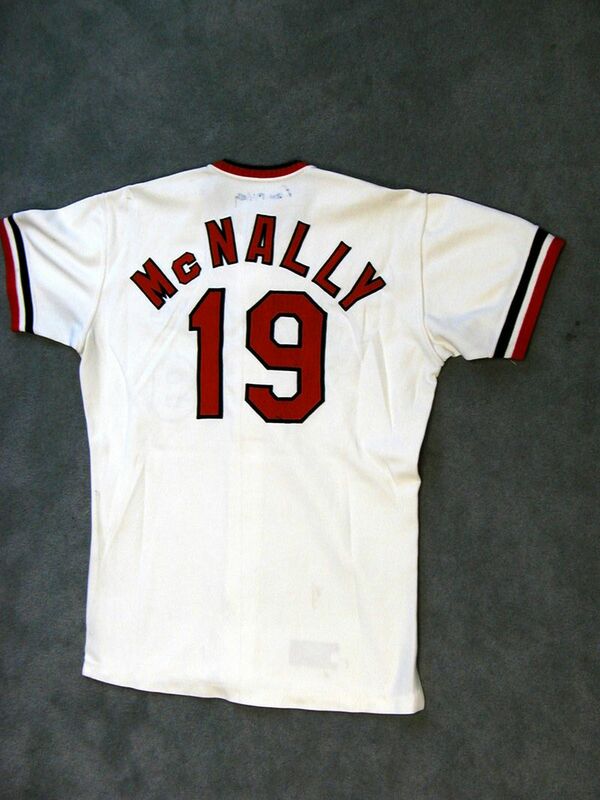 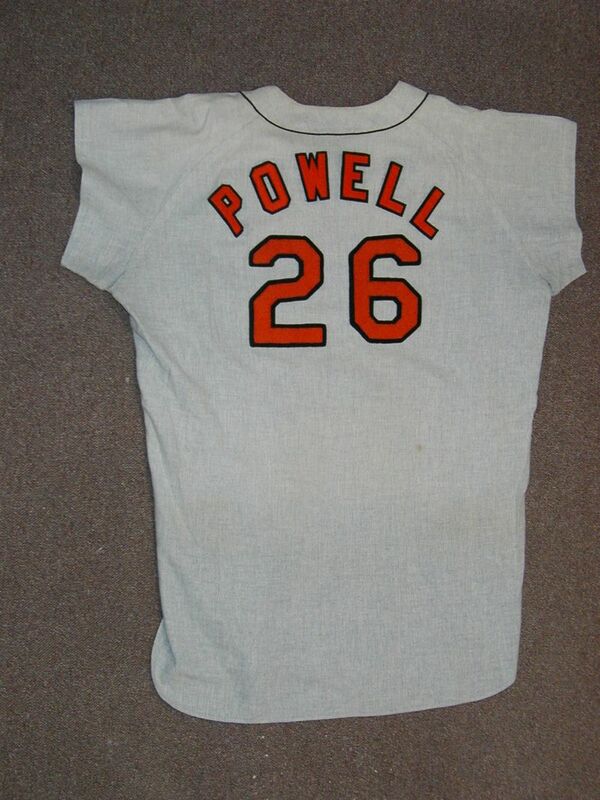 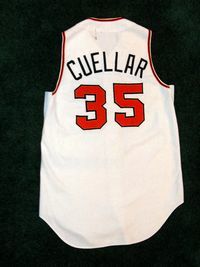 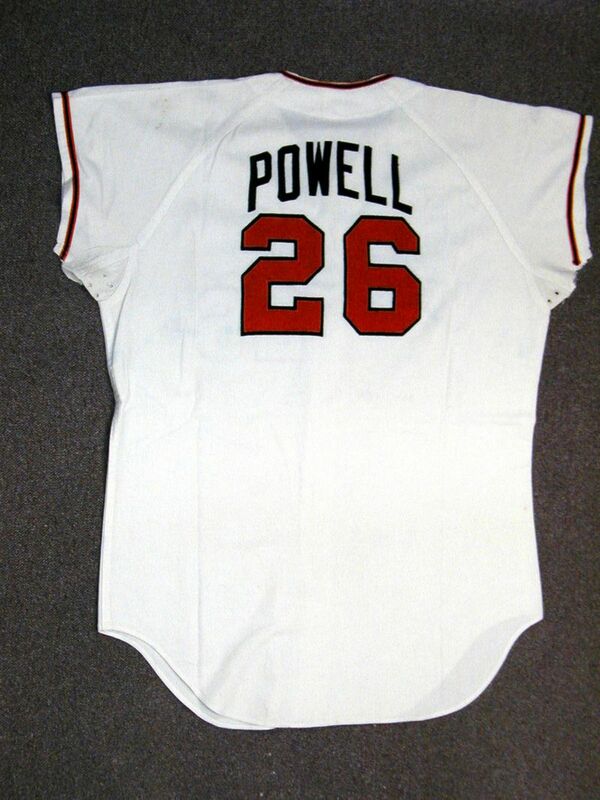 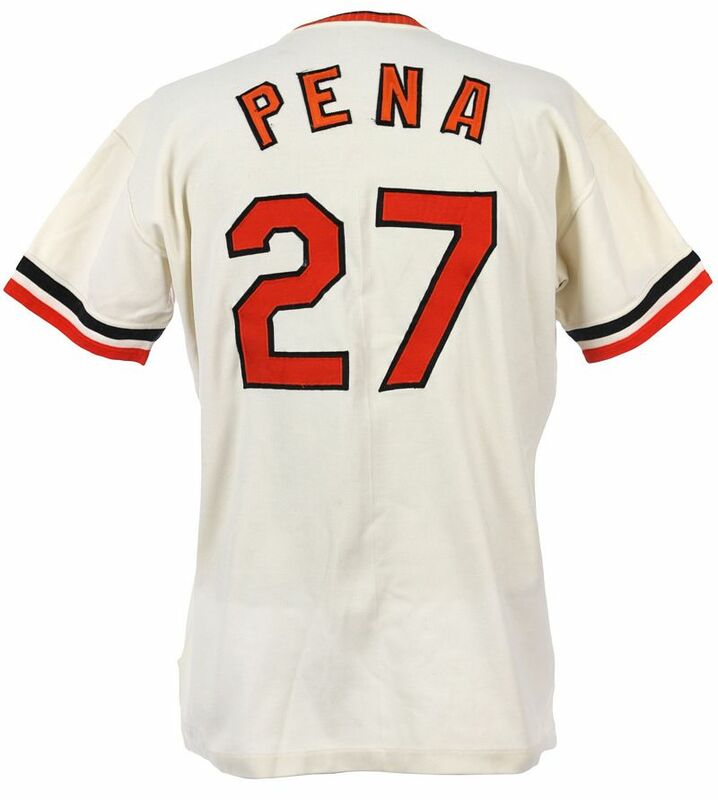 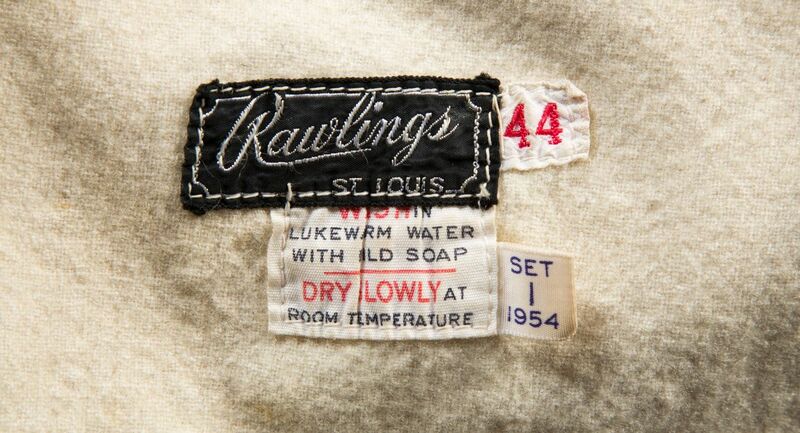 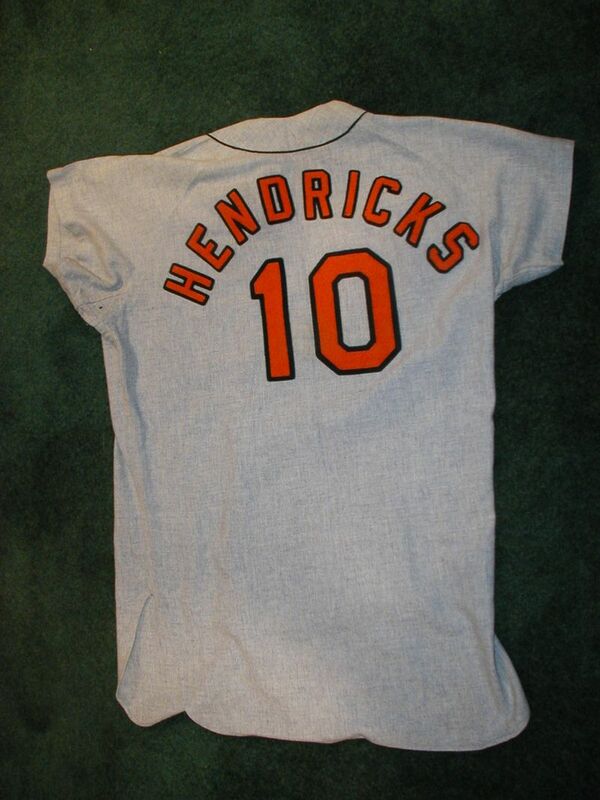 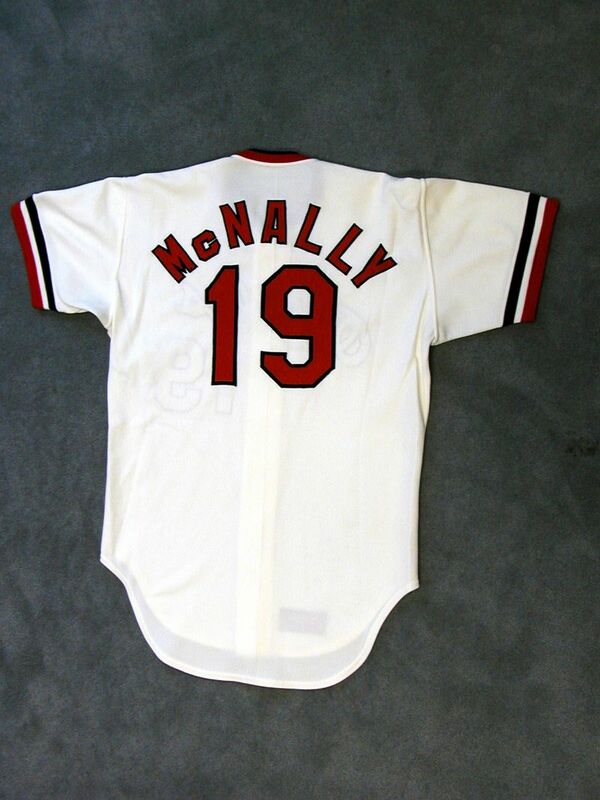 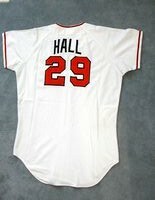 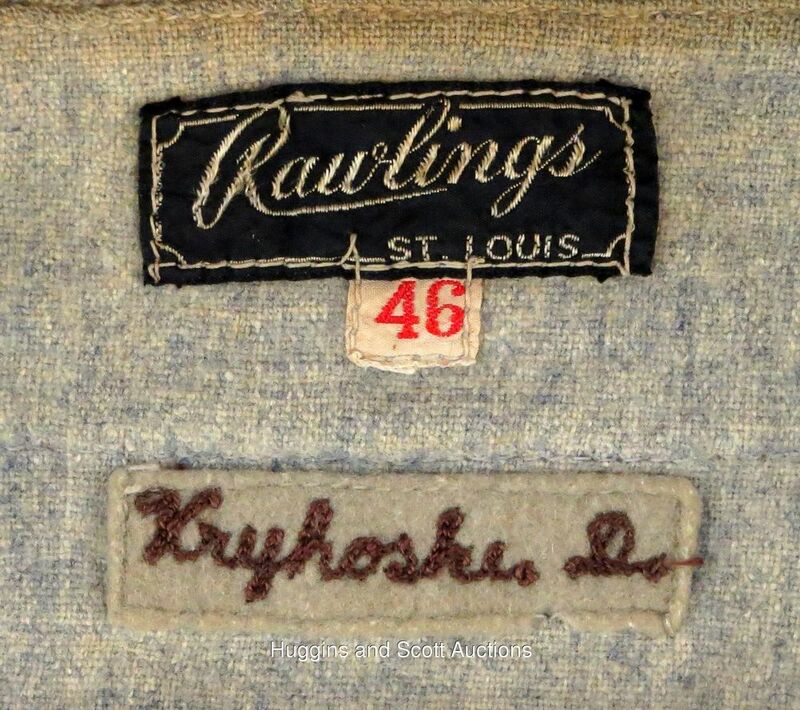 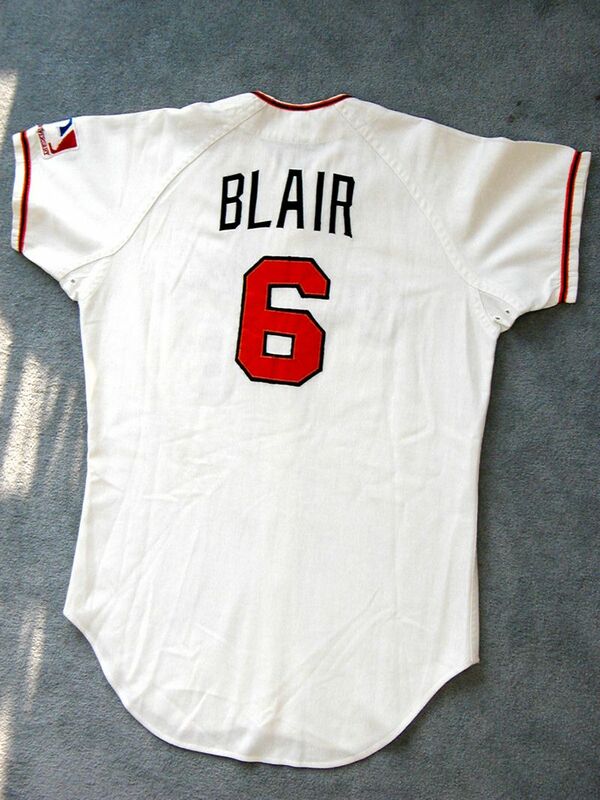 Legendary Auctions sold this jersey and stated it came from the '71 Series. 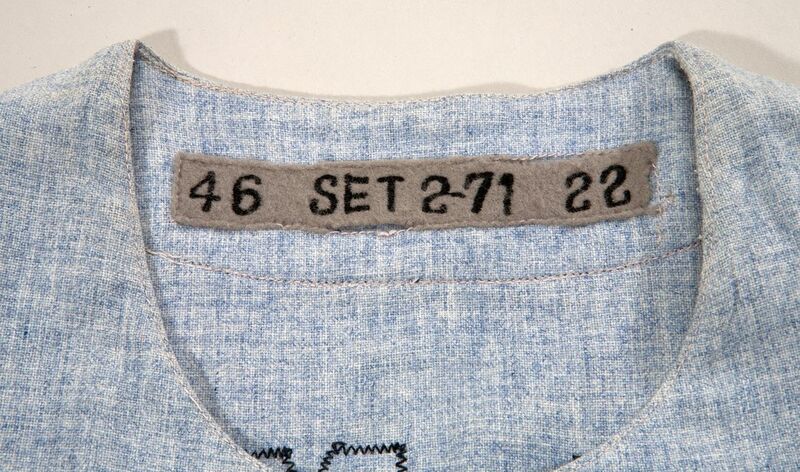 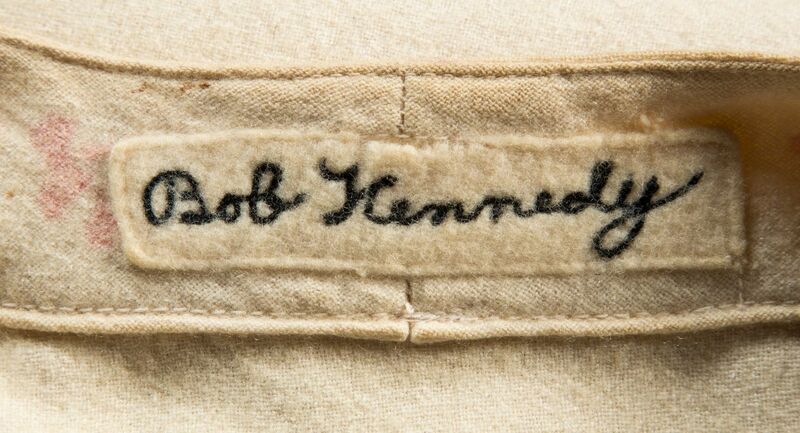 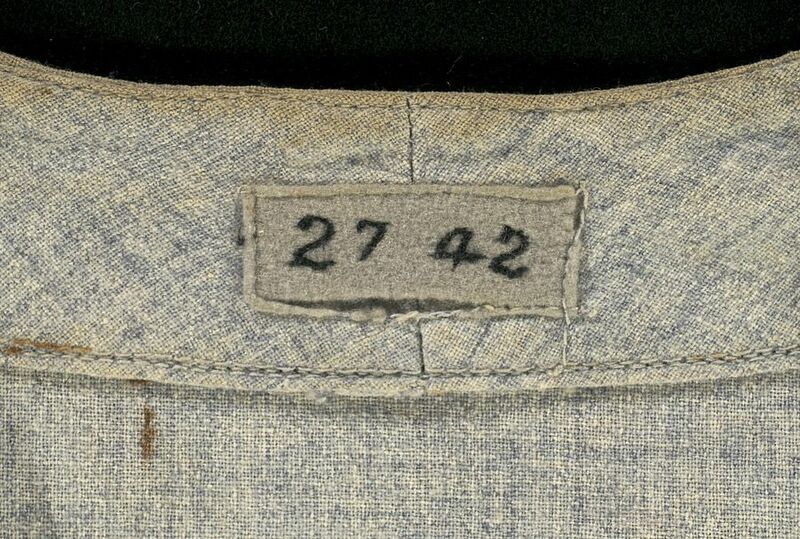 That appears to confirm my suspicion above that 1971 playoff jersey cuffs were sewn on the wrong way, and that the cuffs were removed and resewn the correct way for the '72 season. 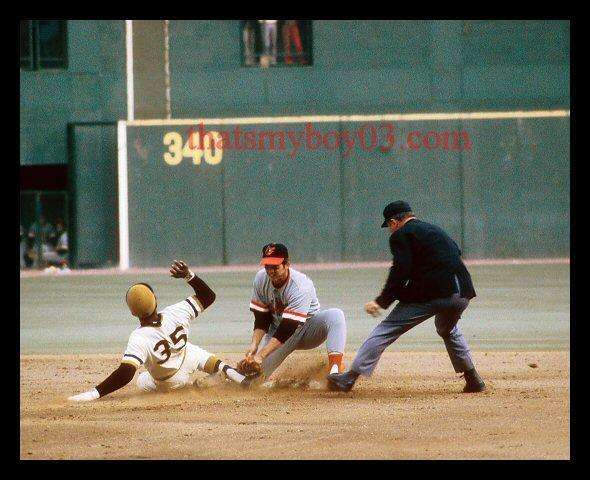 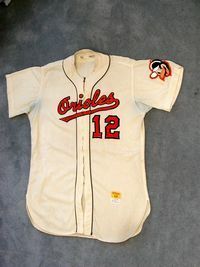 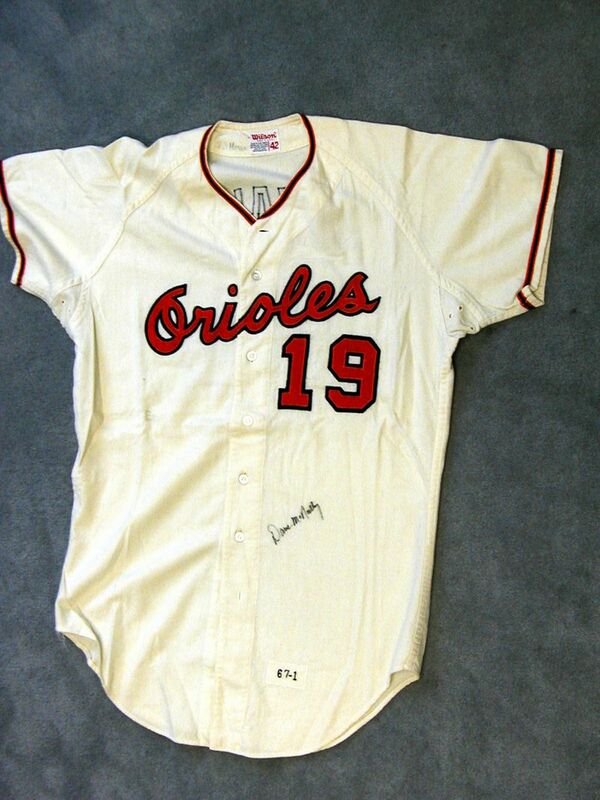 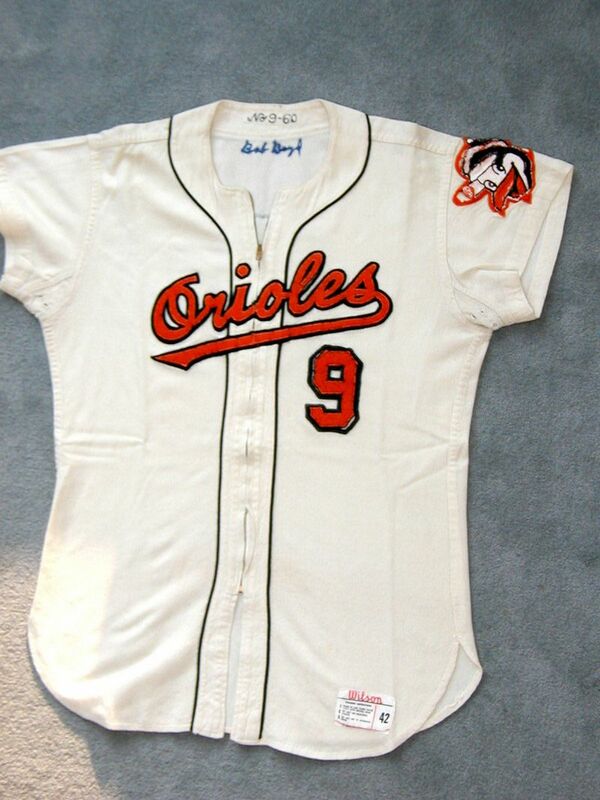 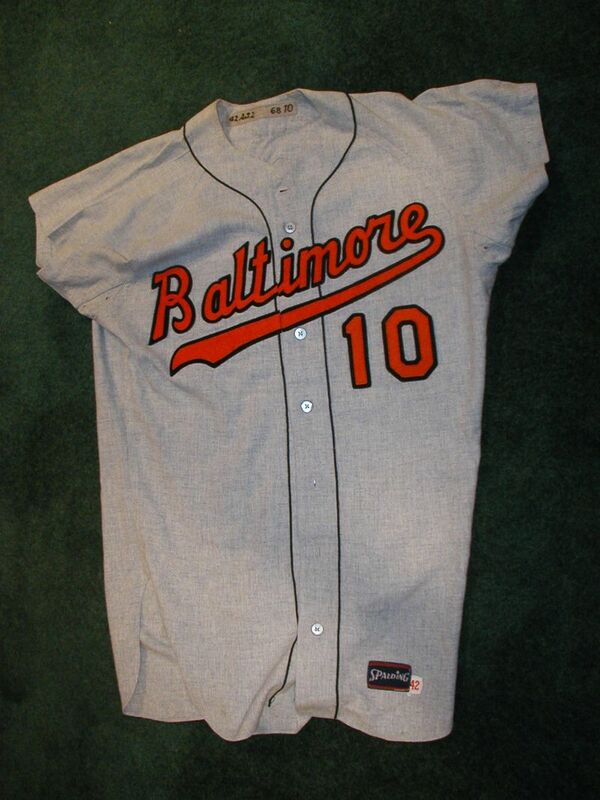 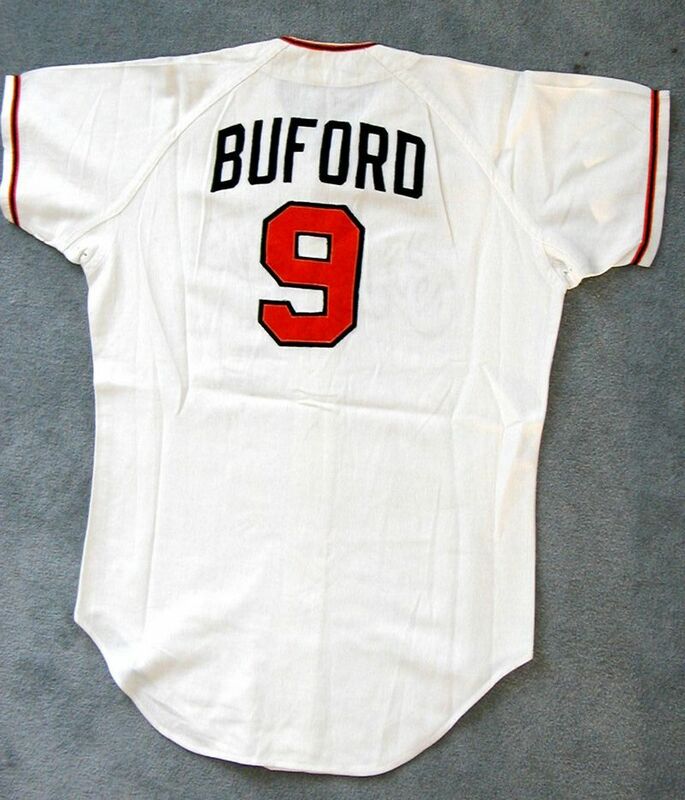 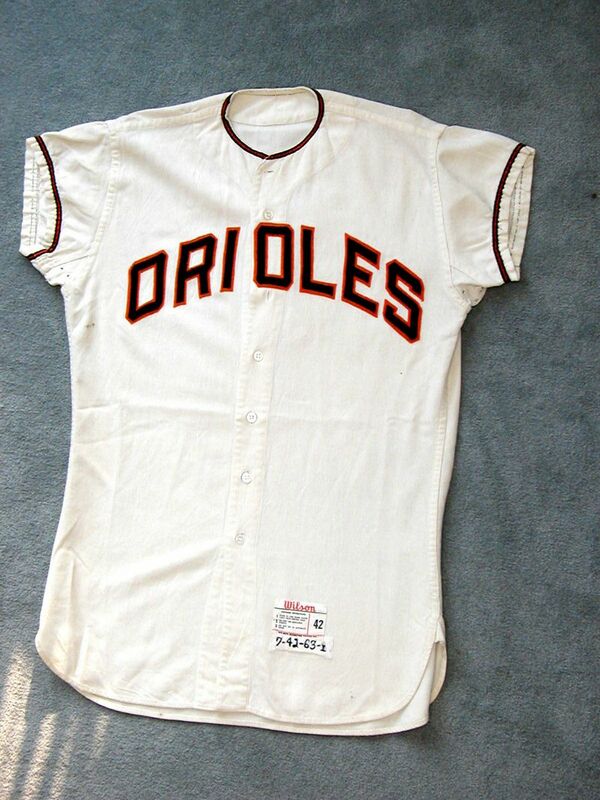 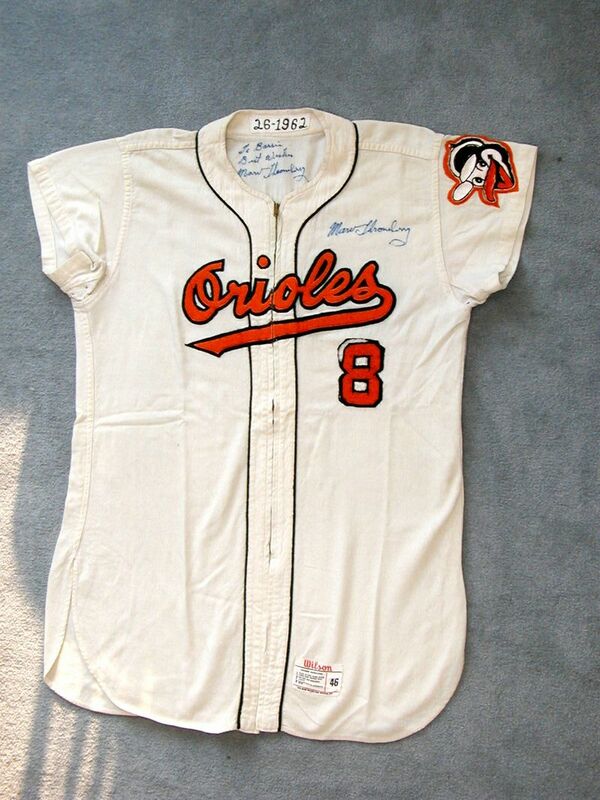 With the Washington Senators gone to Texas, in 1973 "Baltimore" is dropped in favor of "Orioles" on road jerseys. 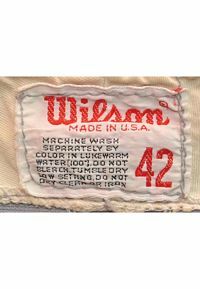 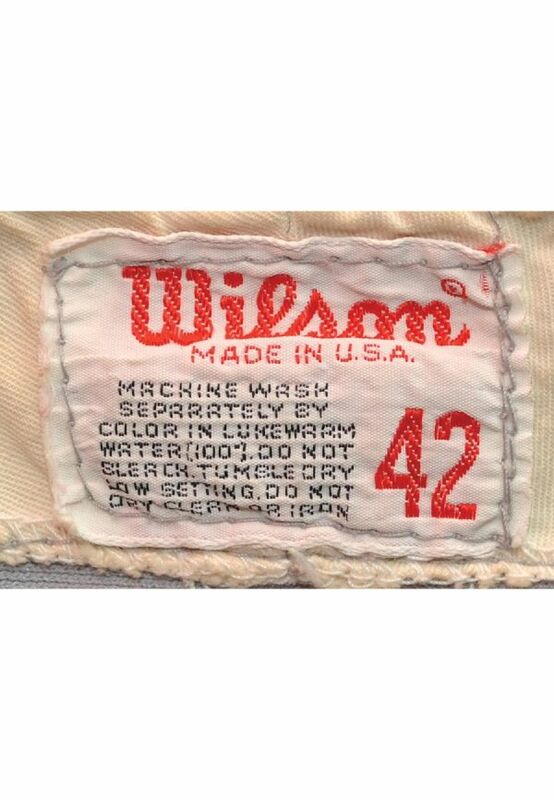 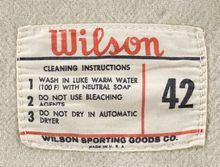 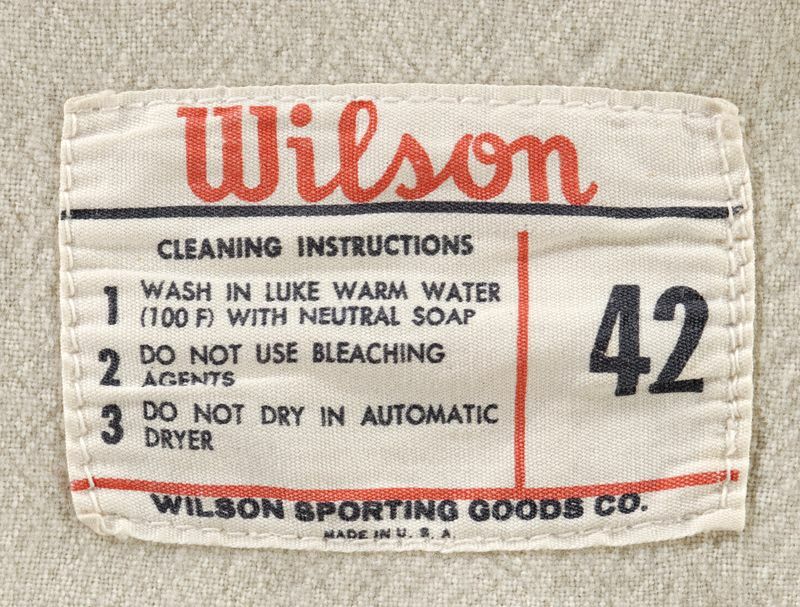 Road jerseys are now made by Wilson and the sleeve cuffs are much smaller than the Spalding model of 1971-72.